Категории: выбор телескопа, оборудование, окуляры, статьи. Very often, beginner amateur astronomers underestimate the importance of the eyepiece, considering that the main thing in the telescope is the diameter of the objective. Nevertheless, the correct choosing of the eyepiece will allow you to use the maximum capabilities of the telescope with a variety of types of observations. In this article I will talk about what eyepieces are, how they differ and which one is better to buy an eyepiece. Through the eyepiece we consider the image that forms the lens of the telescope in the focal plane. To make it easier to understand, imagine two magnifying glasses, a large one as a lens, and a small one as an eyepiece. Many newbies who have just bought a telescope immediately put the maximum magnification on it and then are surprised that nothing is visible except darkness. 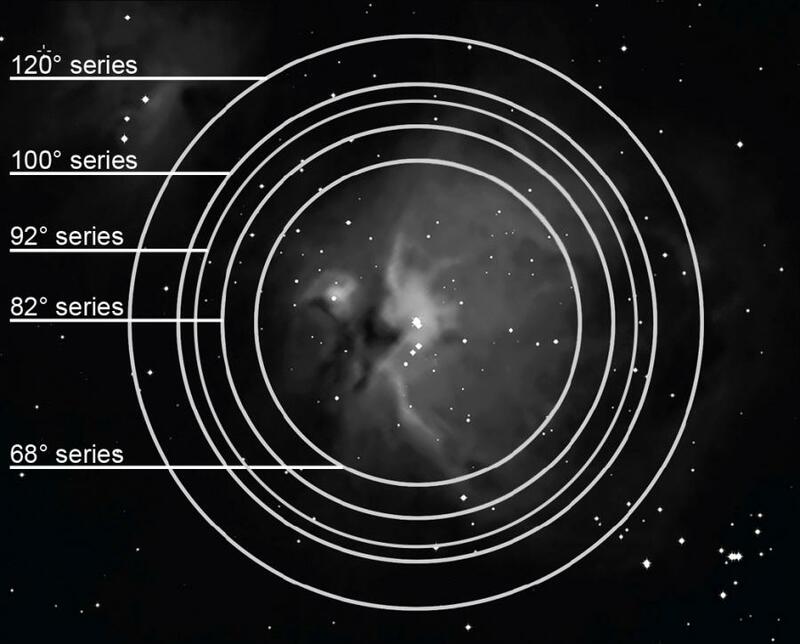 The fact is that some celestial objects must be observed with a large increase (planets, moon, double stars), and others with a minimum or medium (galaxies, nebulae, clusters). Remember – the higher the magnification of the telescope, the lower the brightness of the image and the worse the contrast. Putting an excess increase in the observation of the planets, you will not see anything but a blurry dull spot. View of Saturn through a telescope at various magnifications. As you can see, not always a big increase is the most detailed. One of the most important parameters of the eyepiece is its focal length. Usually it is indicated in the name and marking of the eyepiece (for example, Explore Scientific 11 mm 82 degrees). Here the logic is simple: less focal length of the eyepiece – more magnification of the telescope. The magnification of the telescope can be calculated by dividing the focal length of the telescope by the focal length of the eyepiece. So, if the focus of the telescope is 1000mm, and the eyepiece is 10mm, then the magnification is 100x. The focal length of the eyepieces can vary from 56 to 2 mm. The maximum magnification of a telescope depends on its diameter of its lens and is approximately equal to 1.5 * D … 2 * D., where D is the objective diameter in mm. So, for a 150mm telescope with high-quality optics, the limiting magnification is about 300x. There is also a minimal telescope magnification, which can be calculated by the formula D\7, where D is the objective diameter in mm. For example, a 150mm telescope has a minimum magnification of 21x. Using a smaller magnification (for example, 20x) is impractical, since the light beam from the eyepiece will have a larger diameter than the pupil of the observer, and the light will pass by the eye. However, the use of exit pupils of more than 7 mm is allowed if it is necessary to obtain a larger visible field of view. The brightness of the image will be the same as with lowest magnification, but the central part of the lens will actually work. The size of this output beam (the so-called exit pupil) can be calculated by dividing the diameter of the telescope by magnification. For example, the exit pupil of a 300mm telescope with an increase of 100x is 3 millimeters. As a rule, for observing practically all types of space objects, two or three eyepieces with different focal lengths and a good Barlow lens are sufficient. On the telescope itself there is a special device where the eyepiece is inserted. This device is called a focuser. The barrel diameter of the eyepiece is usually indicated in inches (″). Among amateur telescopes eyepieces with diameters of 1.25″, 2″, less often 0.965″, and even less often – 3 are the most common. Accordingly, with 1.25″ focuser, you can use 1.25″ eyepieces, with 2″ focuser – both 2″ eyepieces and 1.25″ (through a special adapter). Under the 3 ″ eyepiece focusers are not so much – except that the famous Explore Scientific 30mm 100 degrees. The focus of 0.965″ is usually equipped with simple telescopes with an aperture of up to 50mm. 2″-eyepieces allow you to see a larger field of view at the same focal length. For example, a 30 mm 1.25″ eyepiece has a maximum field of view 1.6 times smaller than the 30 mm eyepiece with a 2″ size. Eyepieces with different barrel diameter: ES 11 \ 82 1.25 ″, 24 \ 68 1.25 ″, 30 \ 82 2 ″. In addition, the field of view of the telescope also depends on the eyepiece. There are several types of field of view. 1) the field of view of the eyepiece is the angular size of the image visible through the eyepiece (angular size of the diaphragm). The field of view is usually declared by the manufacturer, but in some cases the numbers may differ from the real value. The field of view of different eyepieces can vary from 38 to 120 degrees. The most common eyepieces, the Pössl system eyepieces, have a field of view of about 50 degrees. However, not always the stated field of view can correspond to the real one. Eyepieces with a field of view from 66 to 82 degrees are also called wide-angle, from 82 to 120 degrees – super-wide-angle. The field of view is indicated either in the specifications or directly in the name of the eyepiece (for example, Explore Scientififc 24 mm 68 degrees). View of the Orion Nebula in the eyepieces with the same focal length, but a different field of view. 2) the true field of view is the angular size of the portion of the sky visible through the eyepiece used with any telescope and with a corresponding magnification. To calculate the true field of view of the telescope, it is necessary to divide the field of view of the eyepiece by magnification. For example, the field of view of the eyepiece is 40 degrees, the magnification of the telescope with this eyepiece is 40 times. We get the true field of view 40 \ 40 = 1 degree (2 angular diameter of the moon). With variable focal length eyepieces (zoom eyepieces), the field of view also changes. As a rule, at the maximum focal distance the field of view is minimal (about 40 degrees), and at the minimum focal length it is maximum (50-66 degrees). When changing the focal length of the eyepiece, you can see how the field of view of the eyepiece itself changes. Another important parameter that newbies rarely pay attention to. The removal of the pupil is the distance from the last lens to the eye, at which the entire field of view of the eyepiece is visible. If the removal of the pupil is small (less than 10 mm) – the observations become uncomfortable, it is necessary to press the eye too tightly to the eyepiece, the eyelashes stain the lens, the eye lens sweats up, and in the cold you can also overcool the eye. The most comfortable removal of the pupil – 15-18 mm. Especially important is the large removal of the pupil for people who make observations with glasses (for example, for the correction of astigmatism). A typical mistake for beginners is to cuddle too close to the eye lens, even if the pupil is more than 15 mm away. In this part of the field of view “falls.” Try to find a comfortable eye position and do not move it when observing from the axis. As a rule, in the plössl \ kelner \ erfle system eyepieces, the pupil can be calculated using the forum 0.7*F, where F is the focal length of the eyepiece. We get that in the eyepiece 20 mm of one of these schemes, the pupil’s takeaway is about 14 mm, and in the eyepiece 4 mm – only 2.8 mm. There are short-focus eyepieces with increased pupil relief (so-called Long Eye Relief). In essence, they are a combination of a long-focus eyepiece and a negative front component (something like a Barlow lens). By the way, the simble non telecentric Barlow lens also slightly increases the removal of the pupil. 5. The type of the eyecup. Most of eyepieces are equipped with a special light-shielding device – the eyecup. The eyecup can be either soft (made of rubber or rubber) or hard rubber / plastic. In addition to the light shielding function, the eyecup also centers the eye so that it does not have to catch the exit pupil. Some eyepieces are not equipped with an eyecup – if you wish, you can make it yourself (for example, from soft thermal insulation for plumbing pipes). Eyepieces with a standard rubber eyecup. For 400 years since the invention of the telescope, eyepieces have undergone significant changes. In the twentieth century with the advent of electronic computers, new methods for calculating eyepieces appeared. In addition, the glass melting technology also did not stand still. Currently, more than a few dozen different schemes are known. Initially, a single collecting lens (Kepler eyepiece) or a single scattering lens (Galilean eyepiece) was used as the eyepiece. Now these eyepiece circuits are practically not used, except in toy telescopes and binoculars. The two-lens eyepieces of the Huygens and Ramdssen systems proved to be more perfect. They are still used in low-cost binoculars and microscopes. The marking usually indicates the letter “H” or “R”, respectively (H20, R10). Almost every budget telescope is equipped with a three-lens eyepiece of the Kellner system. The eyepiece consists of a single lens and achromatic glue. The main advantage of this eyepiece is the low price. The oculars of the Kellner system work well with non-powerful telescopes. Kelners are marked with the letter “K” (for example, K20). The next step is the Plossl eyepiece. The optical scheme of the eyepiece consists of 4 lenses – two glues facing each other with positive lenses. Therefore, it is also called symmetric. Marking – “PL” (PL 12.5). Cheap wide-angle eyepieces are mainly represented by Erfle scheme. This is a five-lens eyepiece with a field of view from 60 to 90 degrees. The advantages include low cost and low F\D ratio. By cons – poor image quality across the field when using fast telescopes (f\5). Eyepiece system Erfle better to use on telescopes with low aperture. A good option to “try” wide-angle eyepieces at a low price. Personally, I myself started with such eyepieces, then switched to higher quality wide-angles. Marking – SWA, SWAN, UW, sometimes UWA. To reduce lens flare, increase light transmission and improve image contrast, eyepiece lenses are covered with a thin film (“coating”). The simplest and cheapest eyepieces can be without any coating at all, which is not good. As a rule, the darker the glare from the eyepiece, the better the coating. The color of coating can be very different – blue, purple, green, orange, red (“ruby”). In good eyepieces glare from the lenses calm green or lilac color. Levenhuk, Orion, William Optics, Meade are not manufacturers. They only buy a batch of eyepieces from other manufacturers (Synta \ Sky-Watcher, Long Perng, UO) and sell under their label. Often the same eyepiece can be in different packages under different brands – for example, William Optics UWAN 28 mm 82 degrees and Levenhuk Ra UWA 28 mm 82 degrees, or Celestron X-Cel LX \ Meade HD. So be careful! The range of prices for eyepieces can be quite large – from 3-4 to 1200 dollars. It all depends on the characteristics and brand. General tips and advice on choosing an eyepiece. 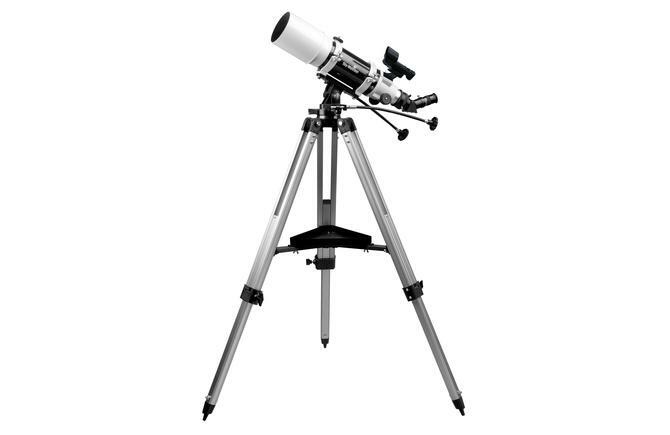 First, you should not immediately after the purchase of the telescope throw out the telescope’s complect eyepieces and run after the new expensive ones. Complete Kelners / plossl with focal lengths of 25, 10, 6.3 mm are quite good. Observe first with complete eyepieces – they are more than enough to familiarize yourself with the sky. Barlow complete lenses useless – they only degrade image quality. Good Barlow’s lens I advise you to purchase separately. If you even decided to take a separate eyepiece, determine the focal length, field of view and price. If things are bad with the budget – take the usual plossl, but with a focal length of 10-7.5 mm. To observe the planets, use them in conjunction with a good Barlow lens. There is a general rule: the higher the focal ratio of the telescope, the higher the requirements for the quality of the eyepiece, namely, the degree of correction of the own aberrations (distortions) of the eyepiece. For example, on the Newton’s high-aperture telescope (f \ 5), eyepieces with the same focal length, but with different optical schemes, will be shown with the same magnification, but different image quality. At the same time, on an slow telescope (for example, Maksutov-Cassegrain) and a simple, better eyepiece will show approximately the same. If you want a wide-angle eyepiece, then the rule is this – for incompatible (f \ 7 … f \ 15) telescopes you can take inexpensive wide-angle eyepieces (such as Deepsky WA, SWA or UW – field of view 60-80 degrees). If a high-aperture telescope (f \ 4-f \ 5) – better-quality wide-angles are desirable (Explore Scientific 68-82 degrees, Televue Nagler, Televue Panoptic), and a telescope of the Newton system is also a coma corrector (GSO, Televue). 11-82 и 30-82 хорошо , какие нибудь ещё промежуточные ещё необходимо ? По планетам 3 мм , а что-нибудь ещё к примеру 7-9 мм celestron xcel lx? Ну, лично мне хватает этих фокусных – 30, 17, 11 и 3. Самые ходовые по дипам – 17 и 11, по планетам тройка. Барлоу не нужна, можно и без неё обойтись. Необязательно брать именно 17 и 11, можно плюс минус 1 мм (например, 10 и 18). Из линейки X-cell LX хороши 25 и 7 мм, отлично работают со светосильным телескопом, остальные не тестировал. А какие для планет ? Здравствуйте. На ньютоне 1:5 у меня самые ходовые окуляры по дипам – Explore Scientific 11 мм 82 гр и Nagler 17 тип 4. Для крупных туманостей использую окуляр Explore Scientific 30 мм 82 гр. Для планет – Levenhuk Ler 3 мм. Сейчас в продаже появился неплохой планетник Explore scientific 3 мм 52 гр. Также неплохи окуляры Meade серии UWA 5000 – у них вроде одна и та же оптика с окулярами ES. При очень ограниченном бюджете можно взять плессл 15 или 17 мм. В комплекте к SW Dob уже вроде есть окуляр 10 мм. Для туманностей очень рекомендую взять фильтр OIII, пусть даже самый бюджетный. Он прекрасно работает по планетарным и газовым туманностям типа Омеги, Вуали, Лагуны. Подскажите пожалулйста, для Sky-Watcher BK1149EQ2 какой брать лучше коллимационный окуляр – короткий или длинный? Добрый вечер. В принципе, можно обойтись и без чешира – сделайте отверстие в затычке для фокусера, вот и весь чешир. 1)Регулируем диагональное зеркало так, чтобы были видны все три лапки главного зеркала и при выкручивании фокусера чтобы они исчезали одновременно. Если всё ок, то крутить диагоналку не надо. 2)Так как светосила телескопа небольшая, нужно добиться того, чтобы тень от диагоналки была точно по центру главного зеркала. Совмещать центр чешира и центр главного зеркала необязательно (тем более, что метки на главном зеркале в 1149 нет). А то на днях я уже хотел сам делать метку на главном зеркале. Значит она там и не нужна, впринципе. Да, и без метки всё нормально юстируется. Пробуйте. На Али через неделю распродажа, цены ES будут процентов на 10-15 ниже, чем брать в TE с возвратом НДС (VAT) при выезде. Насколько на ваш взгляд велика вероятность нарваться там на подделку или брак? Вы бы стали там покупать? Здравствуйте. Окуляры такого уровня тяжело и экономически невыгодно подделывать. На эту тему был большой спор на форуме, вплоть до того, что один окуляр купили у немцев, а второй на али. И в итоге никто не смог определить по фото, где какой окуляр. Так что всё из одной бочки льётся. Что касается покупки, то обязательно следует написать продавцу, чтобы перед отправкой окуляр проверили на дефекты и пыль внутри – мало ли. Если вдруг будут дефекты – можно вернуть часть средств посредство спора на али, но лучше, конечно, чтобы косяков не было. Сам я поглядываю на несколько окуляров – ES 16\68 и ES 14\68, но пока особой нужды брать окуляр там нет. А так – да, я бы купил на али. Посоветуйте пожалуйста какой окуляров нужно брать для наблюдений шаровых скоплений и ярких туманностей чтобы был более мение универсал. У меня светосильная оптика 10″ f5. Завершаются постройку Добсона. Прекрасно понимаю сто нужно 2-3 хороших окуляра. Но средства позволяют пока взять только один. Хотелось бы такой чтобы и волокна в Орионе например просматривались и скопления на звёзды разрешались. Я колеблясь между 25 и 15 из более дорогих с широким полем. Для меня важно чтобы картинка была красивой. Посоветуйте что лучшие? Добрый день. Explore Scientific 11 мм 82 гр 1.25″ – он по шаровым скоплениям и небольшим галактикам хорошо работает. 25 и 15 мм, на мой взгляд, недостаточно. Только сообщите продавцу, чтобы обязательно проверил отсутствие дефектов (пыль, царапины, сколы и т.д.). Здравствуйте, посоветуйте пожалуйста с выбором. У меня ахромат 125мм, 1\9, фокусер 2″, диагональ 1.25″. Из окуляров имеется Meade HD-60 6.5mm (1,25″), и ES24-82 (2″), которым мне не очень удобно пользоваться в силу отсутствия двухдюймовой диагонали. Из-за того, что брал всё по отдельности, получился “зоопарк” окуляров. Имеет ли смысл поменять диагональ на 2″ и в последствии дополнять линейку ES 82гр или для моего телескопа это будет излишне? Наблюдения за пределами города с минимальной засветкой. Здравствуйте. Первый вариант – заменить ES 28\68 2″ на 24\68″. Разница по фокусу там небольшая, но зато форм-фактор намного удобнее, да и качество коррекции искажений у 24 мм лучше, чем у 28 мм. Диапазона 24…8 мм вполне хватит для большинства объектов каталога Мессье. 32 мм вполне можно заменить 1.25″ плесслом, если не требуется большое поле зрения, но более высокая яркость изображения. Низкое увеличение (окуляры 30-40 мм) и большое поле зрения (2″ формат) необходимы для больших тусклых объектов и наблюдений с узкополосными фильтрами – например, OIII или H-beta. Если в планах наблюдения с узкополосными фильтрами – можно смело переходить на 2″ формат. Если нет, то можно и на 1.25″ остаться. Подскажите ещё пожалуйста, из ассортимента svbony 62, 66, 68, и новых 70, 80 градусных, что-то кроме 6/66 заслуживает внимание? О 62 градусных 15 и 23мм отзывались хорошо на cloudynights, но обсуждение старое. 70 градусные, похожи окуляры под брендом agena, которые также имеют хорошие отзывы в соответствующем магазине. Про 80 градусные ничего не нашел. Хотел на пробу взять что-нибудь около 14-16мм, но не знаю из какой линейки. Может не замечу разницы между ES68 и хорошим окуляром с AliExpress на своем ахромате? 4 мм 62 гр у меня есть – ужасный окуляр с сильным хроматизмом и “мылом”. 23 мм 62 гр вроде хвалили, но я всё же советую избегать этой линейки окуляров. Svbony 68 гр – это те же 66 гр, только под своей маркой, поле у них одинаковое. Из них самые хорошие 6 и 9 мм. 15 мм на светосильном телескопе не очень хорошо работают, но при f\9 должно без особых проблем функционировать. Это недорогой SWA окуляр, при невысокой светосиле телескопа работает хорошо по полю. Вынос зрачка комфортный. Про версию 9 мм ничего не скажу – вынос зрачка, скорее всего, небольшой. Разница между ES и бюджетными шириками будет заметна, но не так сильно, как на светосильных телескопах – край чуть мыльнее, больше аберраций. Если в планах переход на что-то светосильное (F\4…f\5), то есть смысл сразу брать ES. Если нет, то хватит и простого широкоугольника 66…72 гр. Реальное поле у него меньше, чем 80 гр. У меня также был 11 мм 80 гр, у него очень маленький вынос зрачка. Насколько помню, они даже на несветосильных телескопах (f\7 и f\13) умудрялись заметно подмыливать край. Итог: если нет в планах перехода на более светосильную аппаратуру – смело берем окуляры 66 или 72 гр. Если же мысли о покупке более светосильного телескопа (ньютон), то есть смысл смотреть в сторону ES 68 гр. Добрый вечер. Хороший телескоп! Для дальнего космоса рекомендую следующие номиналы окуляров: 40…42 мм, 28…32 мм, 20…24 мм, 14..15 мм. Эти фокусные расстояния бывают с посадкой 1.25 и 2 дюйма, а также с различным полем зрения – от 45 до 82 градусов. Из окуляров попроще можно взять обычные плесслы 40, 32, 25 и 15 мм. Они недорогие и каждый стоит около 1200р. Умеренное поле зрения (от 45 до 52 градусов) не является минусом – скорее, особенностью оптической схемы. Они все с посадкой 1.25 дюйма (1.25″). Двухдюймовое зеркало для них покупать не надо. Еще один вариант – бюджетные 2″ окуляры. Качество по полю у них будет хуже, чем у Explore Scientific, но и цена в несколько раз ниже. Например, такие http://ali.pub/32ptvn – за 13 тыс. сразу три окуляра (40, 32, 26). Телескоп системы Шмидта-Кассегрена достаточно неприхотлив к окулярам из-за умеренной светосилы (f\10). Какой у Вас бюджет покупки? Здравствуйте. 7-21 – так себе, его можно смело продавать. 8-24 оставьте. X-Cel LX 5 мм – для предельных увеличений, например, при наблюдении Луны. По планетам не ставьте увеличение больше, чем 350х. По Луне можно 470х. Набор окуляров у Вас неплохой, пока не надо ничего докупать. Здравствуйте, Руслан. А стоит ли покупать окуляры для астро фотографии? И насколько широкое поле зрения и какое фокусное у астрокамер? Стоит ли покупать светофильтры? Например от засветки или цветной? Заранее спасибо! Здравствуйте, Никита. Для астрофотографии окуляр не нужен, вместо окуляра устанавливается камера без объектива. Если объектив у камеры несъемный (цифрокомпакт, камера мобильника), то можно через окуляр снимать, но это будут снимки начального уровня. Поле зрения камеры зависит от размера ее матрицы и фокусного расстояния, поэтому однозначный ответ нельзя дать. С зеркальной камерой формата APS-C (например,Canon 550D) с телескопом BK909AZ3 в поле зрения помещется несколько дисков Луны. Против засветки есть неплохой CLS фильтр, но он работает при съемке с длительными выдержками (от 30 секунд и более). Нужен телескоп с моторизированной монтировкой. Для вашего оборудования есть смысл попробовать лунно-планетную съемку с камерой Canon 550D. Увы, ее уже давно не выпускают, но ее можно приобрести относительно недорого на вторичном рынке (около 9 тыс с объективом 18-55 мм). Почитайте, можете попробовать обработать видеоролик планеты. Здравствуйте. Все эти наборы весьма бестолковы, за схожие деньги лучше купить пару хороших широкоугольных окуляров. Цветные фильтры не особо нужны. Разве что лунный фильтр, и то нейтральный надо брать. Для наблюдения туманностей лучше отдельный OIII взять. Какой у Вас телескоп? Если в комплекте идет оборачивающая призма 45 гр, то лучше докупить диагональное зеркало 1.25″ – лучше картинка и удобнее наблюдения. https://www.sky-watcher-russia.ru/produkti/sky-watcher-nabor-okulyarov-uwa-82-7-mm-15-mm-23-mm/ может этот? И бывают ли переходники с 1.25 дюйма на 2? Бывают, но часть поля будет обрезаться. Либо Celestron X-Cel LX 25 мм также неплох, но поле чуть меньше. Приветствую, Руслан! Возникло желание приобрести окуляр непосредственно для наблюдения Луны. Выбираю между Meade uwa 5.5mm 82°или ES 6.7mm 82°. Что предпочесть? Или может быть посоветуешь ещё что-то. Рефрактор ахромат 909. Здравствуйте. Для Луны я бы взял, пожалуй, 5.5 мм. Судя по тестированию, он весьма неплох. Можно еще присмотреться к Celestron X-Cel LX 5 мм. X-cell lx – хороший окуляр, доводилось смотреть в него. Вот только под мои задачи полем не вышел. Хочу получить максимальное увеличение с максимальным полем, чтобы весь диск Луны умещался целиком. 100 градусники не рассматриваю – дорого. В идеале нужен окуляр 6мм 82°, но такой я не нашёл. Поэтому выбор стоит между 5.5 и 6.7. P.S. тоже склоняюсь к Meade. При такой задаче нужен уже небольшой расчет. Есть подозрение, что с окуляром 5.5 мм (163х) поле зрения окажется ровно 0.5 градуса (82\163). С окуляром 6.7 мм получим поле 82\134=0.61 гр. В данном случае окуляр 6.7 мм будет предпочтительнее. Кроме того, из-за дисторсии видимое поле зрения окуляра может отличаться от расчетного. Поэтому в данном случае правильным выбором будет 6.7 мм. Здравствуйте. Кома проявляется как искажение формы звёзд – они выглядят как птички или кометы, летящие носиками к центру. Если искажен особенно один из углов – следует проверить юстировку.Качество изображения должно ухудшаться равномерно. Можете также повращать окуляр вокруг оси – может быть, это какой-то локальный дефект окуляра, но это маловероятно. Однако комплектные окуляры сами плохо работают со светосильным телескопом, так что кома попросту может утонуть в собственных искажениях окуляров. Плесслы обладают лучшей коррекцией, однако от комы телескопа поможет только корректор комы (а они только в форм-факторе 2 дюйма). Лучше переходить на более качественные окуляры – например, Celestron X-Cel LX 25 мм, 9 мм, 7 мм, ну и, разумеется, Explore Scientific (68 и 82 градуса). Но если в средствах ограничены, вполне сойдут и плесслы, либо X-Cel LX. Спасибо большое за быстрый и развернутый ответ!!! Ещё один вопрос, очень важный для нас: как всё же лучше наблюдать близорукому человеку: в очках или без очков, просто настраивая фокусер под своё зрение? Здравствуйте. Можно смотреть без очков. Если очки без просветления, то они могут отражать около 6% света. Фотохромные очки также немного затемняют изображение и искажают цветовой баланс. Однако если необходимо смотреть на небо невооруженным глазом, а потом в окуляр (например, при быстром просмотре различных объектов), то удобнее, конечно, в очках. Для астрономических наблюдений в очках лучше обратить внимание на окуляры с большим выносом зрачка – от 17 мм. Большое спасибо! Приятно когда человек знает своё дело и имеет грамотный ответ на любой вопрос. Руслан, ещё раз огромное спасибо за помощь в приобретении телескопа! К сожалению погода в Магадане не позволяла вдоволь налюбоваться красотами космоса, но кратеры Луны, звёзды Плеяд, облачка Галактики Андромеды и Туманности Ориона наблюдали всей семьёй! Больше всех в восторге мама в свои 71 )) У нее с детства плохое зрение а тут она увидела кратеры на Луне!!! У меня вопрос по окулярам. В комплекте к телескопу (Mead Polaris 114/1000 EQ) пришли три окуляра: MA (26mm, 9mm и 6.3mm) Плёссл. ЛБ уже заказал по Вашему совету. Что за маркировка (или производитель) МА? И стоит ли купить зум-окуляр на все случаи жизни, один, но хороший, или на мой, начальный, уровень хватит имеющихся окуляров? Здравствуйте! MA – Modified Achromat (модифицированный ахромат, имеется ввиду модифицированный кельнер). Простые окуляры начального уровня, однако с несветосильным телескопом будут работать хорошо. Зум удобен в первую очередь тем, что можно быстро подбрать оптимальное увеличение по объекту, не тратя время на перестановку окуляров. Главное достоинство зума – наглядность. С вашим телескопом он будет тоже хорошо работать. Рекомендую следующий набор под ваш телескоп – 40 мм (для минимального увеличения, но с самой яркой картинкой), 32 мм, зум 8-24 мм (универсальный, в том числе и по Луне), 5.2 мм (планеты, Луна). Либо – 40 мм, 26 мм, 17 мм, 9 мм + 2х Барлоу. 6.3 мм ни туда, и ни сюда – по Луне разве что. По планетам должен неплохо работать, но есть еще запас по увеличению. Ориентируйтесь по бюджету и обстоятельствам. в принципе, у вас набор уже практически скомплектован (можно 9 мм с 2х Барлоу использовать по планетам). 32 или 40 мм я бы точно докупил. Отличная статья! Всё понятно растолковано даже для такого астрочайника как я ) Руслан, еще раз спасибо за помощь в приобретении телескопа! Радости нет предела. Всей семьёй любовались Луной, Плеядами. Посмотрели мелкий диск Марса и даже нашли Галактику Андромеды и Туманность Ориона! Магадан, хоть не мегаполис, но засветка имеет место. Да и погода не позволяла полюбоваться красотами космоса. У меня вопрос по окулярам. В комплекте шли три окуляра: MA (26mm,9mm и 6.3mm) Плёссл. Как считаете, окуляры на мой, начальный, уровень их хватит с телескопом (Ньютон 114/1000)? Есть желание купить зум окуляр, как говорится, на все случаи жизни. И что за маркировка (или производитель МА)? Это вновь Сергей из Германии. Последовал Вашему совету – преобрел Nexstar 6SE. Всем очень доволен! Т.к. был только однин оригинальный 25мм окуляр (четкая и светлая картинка), думаю добавить еще пару окуляров (до 100уе штука). В наличии уже есть планетные 4мм и 6мм (TS Optics, серия HR) и супер плессл 40мм. Первые уже на границе возможного увеличения лежат и дают темное и нечеткое изображение. Что Вы могли бы порекомендовать преобрести (тип и фокусное)? Может комбинация с барлоу? И еще вопрос: что необходимо преобрести для подсоединения Nikon D3000 (байонет). Здравствуйте. Поздравляю! Рад, что Вы довольны телескопом. При такой светосиле телескопа можно обойтись без Барлоу. 4 мм, конечно, избыточен, но по Луне сойдет. Добрый день. У меня ШК Celestron Nexstar 6se. с ним мне досталась диагональ 2″ со стандартом резьбы ШК. Есть ли смысл использовать 2″ окуляры на этом телескопе? Пока у меня только 1.25″ окуляры. Глянул, а диаметр оптического тракта (морковки) все равно не больше чем 1.25 дюйма. Как я понимаю, у 2″го окуляра будет обрезаться поле зрения? Или я получу что то большее, если перейду на 2″ окуляры? Здравствуйте! Поле обрезаться не будет – просто будет виньетирование (затемнение). Я проверял со своим ШК 127 окуляр ES 30\82. Да, потемнение есть, но смотреть, в принципе, можно. Если нужны низкие увеличения – тогда да, можно заморочиться благо на алиэкспрессе есть недорогие длиннофокусники 2″. Если же не нужны, то можно обойтись 32 мм окуляром под 1.25″. Доброго времени суток! Я уже когда-то спрашивала, но не могу найти свой вопрос. Телескоп Orion GoScope 70 Backpack Диаметр объектива 70 мм, фокусное расстояние 350 мм, оптическая система ахроматический рефрактор, относительное отверстие 1:5. В комплекте окуляры Кельнера с посадочным диаметром 10 и 20 мм (1,25″). Хотелось бы подобрать окуляры и\или линзу Барлоу. Вы вроде ответили, что окуляры не нужны (качество изображения станет хуже), а на линзу дали ссылку (https://is.gd/mJU04Y на деле там не 5х, а около 3х). Значит для наблюдения небесных объектов окуляры с бОльшим увеличением будут лишними? А для наблюдения наземных объектов? По идее, там не нужно такое супер качество изображения. Хотелось бы узнать про окуляры и линзы, какие подойдут, с желательно бОльшим увеличением. Нашла одну линзу Барлоу 3х (https://is.gd/t218OF), какая лучше – первая или вторая? Здравствуйте! Да, у той Барлоу 3х на самом деле. Неплохая Барлоу, не меняет вынос зрачка, можно брать. Другое дело, что такой светосильный ахромат больше подходит для наблюдений на низких и средних увеличениях – фокус от 32 до 10 мм (объекты каталога Мессье). Для Луны\планет надо уже до 3 мм. Можно вообще взять отдельный 3.2 мм окуляр. По качеству лучше брать Барлоу или окуляр 3.2мм? Увеличение выходит почти одинаковое (Барлоу 105х, окуляр 109.38x). Можете посоветовать какой окуляр 3.2 (3мм слишком сильно увеличит для моего телескопа?) взять? По Луне и планетам это будет оптимальное увеличение. Спасибо за ответы! И последний вопрос – искать именно такой окуляр 1.25″3.2mm 58 Degree TMB Planetary Eyepiece или в принципе пойдёт любой, главное что бы был 3.2мм? На Aliexpress выбор 3…3.5 мм окуляров практически никакой. Разве что бюджетный TMB или аналоги под другой маркой. Дешевые плесслы\кельнеры 3.6 мм типа такого https://ru.aliexpress.com/item/Angeleyes-1-25-inches-PLOSSL-3-6-mm-high-magnification-eyepiece-for-Astronomical-telescope-High-magnification/32631784405.htm – плохие. Всё остальное – сильно дороже. Здравствуйте, Руслан. Если Вас не затруднит, Вы бы не могли посмотреть по этой сноске https://www.skyhunters.lv/Refraktora-Teleskops-National-Geographics-90-900-ar-EQ3-mont%c4%93jumu/ данный телескоп. Я собираюсь его приобрести, но меня настораживает текст «Вам не придется даже задумывать о том, нужно ли что-то докупить – все необходимое уже есть в комплекте.» Вы, как специалист, можете мне сказать про этот телескоп. Заранее благодарен и извините за потраченное на меня время. Здравствуйте, Михаил. Труба неплохая. А вот окуляры в комплекте не особо качественные. Да и цена накручена сильно на телескоп – это ж National Geographics! Огромнейшее спасибо. Ваш совет для меня ценен. Давно не тревожил вас вопросами, так как вы научили меня базовыми знаниями как пользоваться телескопом и какие дополнительные аксессуары будут полезны для наблюдения луны и планет. И лишь только поэтому, я смог осуществить свою давнюю мечту, увидеть собственным глазом планету – Сатурн. И не только наблюдать за ним, но и сделать снимок! За что вам очень благодарен! Пусть все любители астрономии это знают, какой классный вы наставник…. С луной и планетами, остаётся лишь развиваться далее..
Пришло время начать освоения знаний по галактикам и туманностям. Для наблюдения конской головы надо достаточно темное небо и отсутствие Луны. С увеличением лучше поэкспериментировать, от D\6 до D\2, где D – диаметр объектива в мм. Зимой пытался ее увидеть в 300 мм Добсон с H-beta фильтром – сама туманность видна, а вот темный провал головы – ну вообще никак. Возможно, фильтр у меня плохой был, возможно, что контраст низкий из-за засветки. Заснять Конскую голову также весьма непросто – желателен H-alpha фильтр (не H-beta! ), точная монтировка и выдержки хотя бы от 30-60 секунд. Туманность Андромеды лучше смотреть без фильтров вообще – на темном небе она видна даже невооруженным глазом. Заснять ее попроще, но нужны всё же выдержки от 20-30 секунд. Спасибо за ответ и инструкцию. Закажу “H-alpha”. Руслан, а что можно наблюдать,… вообще какое предназначение у этого фильтра “H-beta”? H-beta – это водородный фильтр для визуала. Работает по немногим объектам. По туманностям обычно самый ходовой фильтр – OIII, его обязательно советую купить, пусть даже самый недорогой. H-alpha – для астрофото. Также можно недорогой взять, 12 нм – вполне достаточен. Всё, теперь начну усваивать всю информацию и делать заказы..
Пока закажу на али, а там посмотрим. Здравствуйте. На светосильном телескопе он будет плохо работать. Не рекомендую. А что из недорогого можно попробовать? Интересуют, в основном, объекты Месье. Или только на барахолке ловить? Обычный плессл 15-17 мм. Или недорогой широкоугольник 15 мм 66 гр. В 2″ окулярах надобности особой нет на этом телескопе, можно вполне обойтись 1.25 окулярами. По каталогу Мессье вполне рабочий диапазон – 10…17 мм. А разве у двухдюймового окуляра не будет, значительно, больше поле зрения? Будет, но на таком небольшом телескопе вполне можно обойтись 1.25 окулярами. Присмотритесь с линейке окуляров Explore Scientific 68 и 82 градуса, особенно к модели 24 мм 68 гр 1.25″ и 11 мм 82 гр. Можно также посмотреть ES 14 мм 82 гр – он хоть и 1.25, но поле 82 градуса. Добрый день, к celestron mak 90 хочу взять дополнительные окуляры, думаю взять Celestron Zoom 8-24 или Meade Eyepiece zoom 8-24, по цене разница не большая, а по качеству? стоит ли их вообще брать к данной трубе? Здравствуйте. Одно и то же. На маке 90 этот окуляр фактически штатный – подойдет для наблюдения большей части объектов. Для дипская советую взять еще 40 или 32 мм плессл. Извиняюсь за одно и тоже! Меня не покидает мысль что окуляры серии X-Cel LX/Celestron для телескопа со светосилой 1:5 не совсем подойдут! В плане того, что телескоп раскроет себя не настолько насколько мог например с окулярами от Tele Vue или Baader и Explore Scientific, в чём будет разница между всеми этими окулярами не взирая на поле зрения окуляров?! Может снизить планку и обратить внимание на телескоп со светосилой 1:6 и окуляры?! Или вообще уже забыть про Добсоны и сидеть на своём 909 рефракторе! X-Cel LX 25, 9, 7 и 4.5 на светосиле 1:5 пойдут совсем, я уверен. Ориентируйтесь по цене и обстоятельствам. Широкоугольный окуляр необязателен к покупке, люди годами успешно смотрят в плесслы и не жалуются. Интересно стоит на него обратить внимание?! Дешевый ультраширокоугольник. Более-менее будет работать на Добе 6, на 10 противопоказан из-за высокой светосилы. Берлоу 2. нужна или нет? Нужны ли фильтры ( луна)? Здравствуйте! Линза Барлоу нужна больше для астрофото. При визуальных наблюдениях можно обойтись и без нее. Из окуляров я бы добавил еще 40 мм и 7 мм. Также на маке очень удобен зум-окуляр Celestron 8-24 мм. В связке с 32 или 40 мм окуляром он покрывает почти все нужные увеличения. Здравствуйте. Для этого фотообъектива подойдут окуляры с фокусным расстоянием от 40 до 7 мм, но нужен будет переходник с родной резьбы на 1.25″. Если бюджет ограничен – можно взять окуляры системы кельнера или плессла. Неплохим выбором будет зум-окуляр Celestron 8-24 мм – он охватит большую часть нужных увеличений. Добрый вечер!Скажите,909 рефрактор,комплектный окуляр 25мм(36х) и (если купить)окуляр 32мм(28х).Разница в кратности небольшая.А при наблюдении разница между ними будет не очень значительная? (раздумываю брать/не брать).По обзору 32мм не намного уж превосходит 25мм?Или разница существенно заметна? Здравствуйте. Разница как раз таки очень заметная. В 32 мм картинка в 1.6 раз ярче. По обзору они достаточно близкие, однако у 32 мм всё же поле больше. Пожалуйста. 32 мм себя хорошо проявит на темном небе по слабым протяженным объектам. «Максимальное поле зрения телескопа зависит только от фокусного расстояния объектива телескопа и размера полевой диафрагмы окуляра. Для обзорного подбирается окуляр с наибольшим фокусным расстоянием, чтобы обеспечить максимальную яркость картинки. Максимальное поле зрения окуляра также зависит от его фокусного расстояния и размера полевой диафрагмы. Для окуляра 32 мм получим 27/32*57,3 = 48,3°. То что написано в характеристиках окуляра — это среднее по серии. Тогда вопрос: где целесообразно использование окуляров 40 мм 1.25 дюйма и зачем их делают, если предел 32 мм ? Целесообразно на телескопа со светосилой 1:6…1:15. Делают для того, чтобы получить меньшее увелиение – при этом получим больший выходной зрачок и, соответственно, большую яркость. Постоянно перечитываю Ваши комментарии по выбору окуляров. На сколько это жесткое ограничение? Получается, что про обычный 40 мм окуляр для фокусера 1.25″ и говорить нечего. Здравствуйте. Это ограничение задано конструктивно. Так, 32 мм окуляр в формате 1.25″ обладает полем не более, чем 52 гр. Дальше же просто некуда расширять поле, видна вся входная диафрагм. Хотите большего поля при том же фокусе – надо брать уже 2″ окуляр. Добрый день! Подскажите или под корректируйте те мой выбор,пожалуйста. Для модели sw bkp150750 подбираю окуляры: 6mm, zoom8-24( не вижу,есть ли 7-21?) и 32mm? Но сомневаюсь,будет ли этот зум уместен к этой модели или брать окуляры по отдельности? Или такая комбинация: 5-7-10-16-32? Здравствуйте. 5 мм заменить на 3 мм (для планет). Семерка не особо нужна. Самые ходовые – 16-18 мм и 10-11 мм. В качестве обзорника можно взять ES 24\68, либо Celestron X-Cel LX 25 мм. Зум не советую, на 24 мм он узкий слишком (поле 40 гр), да и аберрации заметны. 7-21 мм зум еще хуже. Принято! Только,если можно, еще вопрос: из ответа я так понял,что ЛБ(например 6мм+ЛБ) на этой модели не особо приветствуется,или я не прав? Подскажите тогда ,,3мм” с комфортным выносом зрачка для нормального зрения и для очкарика. Лично мне отдельный 3 мм окуляр больше нравится, чем 6 мм + Барлоу. Отличное качество картинки по полю. Вынос и глазная линза поменьше, чем у Баадера. Я прислушаюсь к Вашим советам. ЕЩЕ РАЗ СПАСИБО, ВАМ ! Пожалуйста. Попробуйте заполнить форму в нижней части сайта. Боковая ссылка может не работать, я проверю ее. Здравствуйте. С таким выносом – нет. Разве что Celestron X-Cel LX 5 мм, но у него вынос 16 мм. Здравствуйте, я купил телескоп Synta bk909 eq2 , что скажите о нём вкратце, и самое главное подскажите пожалуйста какие докупить мне окуляры, потому что штатные вроде и не плохие, но хотелось бы по лучше, особенно важно выбрать окуляр с фокусным расстоянием 5 мм для планет и большим выносом зрачка?! Здравствуйте. Хороший телескоп. Я бы докупил еще 32 мм окуляр для галактик\туманностей\скоплений. 5 мм можно взять Celestron X-Cel LX, качественный окуляр с большим выносом. Огромное спасибо Вам, я хотел купить Sky-watcher uwa 58 градусов на 5 мм, но всё же сомневался из за того что я ношу очки и , что мне нужен окуляр с выносом зрачка где то 20 мм! Здравствуйте. Ну, тогда Вам нужен Baader Hyperion 5 мм, у него вынос 20 мм. Но для московской засветки покупать хорошие окуляры пока не готов. Засветка накладывает свои ограничения, как и бюджет. Комплект обычных плесслов вполне позволяет закрыть все нужные увеличения, кроме планетных. Здравствуйсте! Sky watcher 1309,подскажите пожалуйста какие окуляры купить для планет и дипская? Здравствуйте. Для дипов – 32 мм 1.25″. В комплекте вроде 25 мм есть, он тоже подойдет. Для планет – как написал ниже, либо Celestron X-Cel LX 5 мм, либо Explore Scientific 4.7 мм. Август 19, 2018 в 15:01 Вы рекомендовали “для 130\650 мм ньютона минимальное полезное увеличение составляет D\6, то есть 22х.” окуляр “около 30 мм реальное поле зрения около 2.4…2.5 градуса”. и сделали расчет для 24 мм (увеличение 650\24=27х) . Или 24 мм с полем 68 гр предпочтительней? Хотя я такого на Али не нашел. Может 2,2 гр. тоже неплохо и суетиться не надо? Здравствуйте. Да, можно поставить и 32 мм. Поле будет примерно такое же, но не больше, чем у 24\68. Вариант побюджетнее, но тоже с хорошим качеством изображения, Celestron X-Cel LX 25 мм 60 гр. А тот бюджетный 23\62 по качеству картинки будет намного хуже, чем 24\68 и 25\60. Ваше мнение про такой окуляр,стоит его покупать или нет? Телескоп Sky-Watcher BK 707 AZ2. Здравствуйте. Это ультрабюджетный зум-окуляр. У него передняя линза вроде даже без просветления. Я рекомендую взять проверенный Celestron Zoom 8-24 мм. У него с просветлением и качеством всё в порядке. Если “При использовании Барлоу поле зрения (реальное) уменьшается в несколько раз (в 2х, в данном случае)”, то что использовать предпочтительней для Sky-Watcher Star Discovery P130 окуляр 5 мм с Барлоу 2х или 2,5 мм ? На ньютоне с отн. отверстием 1:5 по планетам оптимален 3 мм окуляр. Это либо 9 мм + 3х Барлоу, либо 6 мм + 2х Барлоу, либо отдельный окуляр. Я рекомендую использовать отдельный окуляр, но при ограничении в финансах сойдет и Барлоу + недорогой 6…9 мм окуляр. Я “начинающий”, у меня телескоп для начинающих Sky-Watcher Star Discovery P130 SynScan GOTO. Меня он соблазнил более крепкой треногой и продвинутой монтировкой, ну и ценой. Осваиваю. Вопрос у меня по истинному полю зрения. Как оно считается я понял из комментариев Январь 21, 2017 в 15:02 (.52/28=1,86 гр. ), Но про него почти ничего не пишется, оно мало кого интересует? Не нашел рекомендаций для каких объектов, какое истинное поле зрения предпочтительней. Или чем больше, тем лучше? Второй вопрос: меняется ли истинное поле зрения при использовании ЛБ2х, например, и окуляров 3 мм и 6 мм с одинаковым полем зрения? Поле зрения телескопа (без учета дисторсии окуляра) – поле зрения окуляра, деленное на увеличение. Если поле зрения окуляра составляет 82 градуса, а увеличение 82х, то получаем 1 градус реального поля зрения (примерно 2 лунных диска). Для 130\650 мм ньютона минимальное полезное увеличение составляет D\6, то есть 22х. Для этого нужен окуляр с фокусным расстоянием около 30 мм с полем зрения около 52 гр. Получим реальное поле зрения около 2.4…2.5 градуса. Можно поставить окуляр с фокусом 24 мм и полем 68 гр (увеличение 650\24=27х), получим то же самое поле, но увеличение будет больше. Если поставим окуляр с полем 52 гр, но фокусным расстоянием 24 мм, получим меньшее видимое поле зрения соответственно. При использоваии Барлоу поле зрения (реальное) уменьшается в несколько раз (в 2х, в данном случае). Добрый вечер. Приобрёл SW BK 1145 EQ1 (f/4,4). К штатным окулярам 4, 12.5, 20 мм добавил плёсс DO-GSO 6 mm и ЛБ DO-GSO 2-x. Порекомендуйте чем заменить штатные окуляры и какие взять широкоформатные. Спасибо. Здравствуйте! Хороший наборчик. У меня самого такой телескоп. Светосильный ньютон весьма требователен к качеству окуляров. Лично я использую окуляры Explore Scientific 11 мм 82 гр и 24 мм 68 гр. У них хорошая коррекция собственных искажений. Увы, стоимость у них достаточно высокая. Многие недорогие широкоугольники на светосильном ньютоне будут работать плохо. Можно попробовать широкоугольник 9 мм 66 градусов. Также неплох Celestron X-Cel LX 25 мм 60 градусов. есть телескоп Sky-Watcher BK1149EQ2, с ним шли два окуляра 10 мм и 25, пока наблюдала только планеты, и подскажите, подойдут они для наблюдения объектов дальнего космоса или стоит прикупить дополнительные окуляры? Здравствуйте. Да, подойдут, особенно 25 мм. Я бы докупил еще 32 мм окуляр 1.25″. А они не будут тяжёлые для 767? Не будут. Фокусер хоть пластиковый, но окуляры без проблем выдержит. Приобрел synta 767az. Аппарат кривой конечно в настройке. Говорят, что sw767 намного лучше. Наблюдаю с балкона. Сейчас белые ночи и мало что видно. В комплектных линзах – юпитер не очень (жёлтая горошина) Сатурн ( кольца и щель между планетой) Марс горошина. Что можете посоветовать для апгрейда телескопа. Планирую смотреть deep и планеты. И есть ли смысл его замены на sw? Привет! Так Synta и SW – одинаковые. Смысла нет менять. По планетам много не требуйте, в СПб Сатурн и Марс нынче низко. Очень плохо подстраивается главное зеркало. Винты на перекос идут. Соответственно все постоянно сбивается. Делаю вроде все по инструкции – ослабил стопора, по звездным выкручаю юстировочные до получения симметричного изображения ( правда паук при этом вижу). Начанаю стопара крутить и все сбивается. Может на sw конструкция получше будет? Или тот же Китай? Это тот же Китай, 1 в 1, просто название другое. Юстировку я рекондую делать иначе. 1. Сделайте 1 мм отверстие в родной черной затычке для фокусера – это будет юстировочным окуляром. Вставьте ее вместо окуляра и наведите трубу на светлую стену. 2. Внимательно посмотрите в юстировочный окуляр. Вы видите диагональное зеркало, а в нем отражение главного зеркала. Само главное зеркало держитс на трех лапках. Так вот, в отражении диагонального зеркала должны быть видны все три лапки. Покрутите ручку фокусера – они должны появлятьсяя и исчезать одновременно. Если нет – крутим аккуратно 3 винта под 120 градусов на диагональном зеркале, без фанатизма. 3. Если видны три лапки, переходим к проверке главного зеркала. Тень от диагонального зеркала – черный кружок на темном фоне – должен быть точно по центру большого светлого кружочка. Если нет – крутим юстировочные винты на главном зеркале. Там три стопорных, три юстировочных. Настроили, закрутили юстировочные винты (без фанатизма). Они системы тяни-толкай, поэтому надо там аккуратно настраивать. Вот и всё. Повторюсь, телескоп хороший – я смотрел в такой, а также аналогичный Celestron. 1. Если лапок нет, то и так пойдет, как Вы сделали. 2. Не юстируйте по звезде. Достаточно примерной юстировки по положению тени диагонального зеркала. Закручиваете стопорные и всё. Попробуйте юстирвочные винты закрутить по часовой стрелке и регулировать юстировку вращением винтов против часовой. Почему не юстировать по звезде? Ведь везде это самое необходимое. По окулярам вопрос, вы в своей статье об 6 мм давали другие ссылки на 6 мм и на 32мм. Их использовать или те которые сейчас в этом посте? Потому что юстировкой по звезде не получится установить положение диагонального зеркала. Всё равно нужен юстировочный окуляр. И лазерный коллиматор для этой цели тоже не очень подойдет, т.к. лазер может бить в центр главного зеркала, однако лапки на главном зеркале не все будут видны. Юстировка по звезде используется в качестве основной в зеркально-линзовых телескопах типа Максутова-Кассегрена или Шмидт-Кассегрена, вот у них чешир бесполезен. Для обычного несветосильного ньютона достаточно самодельного чешира из затычки для фокусера. По ссылкам на окуляры – они больше для примера. Можете найти у другого продавца, с другим типом доставки, либо дешевле. Огромное спасибо за совет. Вы то какие для себя покупали? Я брал 6 мм 66 гр, 15 мм 66 гр, Celestron Zoom 8-24 мм и 32 мм плёссл. Без нареканий. Почитал проблему Кирилла. Т.к. у меня такой же телескоп, поделюсь доработкой. Стопорные винты я выкрутил. Вообще. Оставил только юстировочные. Фишка в том, что я вставил между корпусом телескопа и пластиковой пластиной, на которой держится главное зеркало шайбы гровера. Три штуки – на каждый винт по шайбе. Они работают как пружины. Теперь не нужно ослаблять стопорные винты, подстраивать юстировку и зажимать их. Внатуре всё сбивается. Шайба гровера пружинит и сама толкает пластину с зеркалом при ослаблении юстировочных винтов. С такой приблудой юстировка в 10 раз быстрее проходит и в 100 раз проще. P.S. т.к. при вставке шайбы появится щель в 1-2мм, то крайне желательно заткнуть её чем-либо.Чтобы пыль не попадала. Я нарезал кучу кусочков толстого мягкого двустороннего скотча и приклеил по периметру. Всё лето таскаю телескоп по разным балконам и за город. До сих пор юстировка не сбилась (с мая). Здравствуйте посоветуйте калькулятор телескопа а именно для расчета обзора окуляров,случайно нашел сайт http://www.astrocalc.ru/#D=150&F=1000&Fs=1.25 там мои расчеты,но я так и не понял про обзор окуляра что за цифры 1° 32′ 59″ (1.550°),прочитал описание данного расчета,я понял что 32 это минимум а 59 максимум обзора? подскажите,может я ошибаюсь. Здравствуйте. В окружности – 360 градусов. В 1 градусе – 60 угловых минут (‘). В 1 угловой минуте – 60 угловых секунд (“). 1.550 – это градусы в численном представлении, а 1° 32′ 59″ – с переводом в градусы, минуты, секунды. Руслан, добрый день. Помогите, пожалуйста, с выбором окуляра. Приобрел Sky-Watcher dob8, в комплекте окуляры Super Plossl 25 и 10, поле по 52°. Стоит ли заменить их на что-то более стоящее (всякие наглеры по деньгам точно не осилю:), может быть заменить на ES, есть ли смысл? Или может просто докупить к штатным еще 1-2? Что можете порекомендовать? И вопрос по фильтрам. Планирую приобрести 1 для дипов, взять лучше ОIII или UHC? И есть ли смысл брать цветные планетарные? Советую взять в качестве универсального по дипам окуляр ES 20 мм 68 гр 1.25″. Для мелких галактик, туманностей и шаровиков – что-нибудь с фокусом 14 мм, тот же ES 14\82. Из фильтров – разумеется, OIII. Дешевые UHC больше работают как подавители засветки, а дорогие стоят весьма много. Планеты наблюдаю без фильтров – мне больше нравится неискаженный цвет планет. Такого набора хватит практически для всех видов наблюдений. Штатные сильно будут проигрывать вышеуказанным по качеству изображения? Что-то более длиннофокусное брать не стоит? В районе 30 мм? С 3.5 мм планеты не станут неуловимыми в доб? :) или широкоугольность облегчит задачу? Штатные – да, намного хуже. 30 мм не помешает, но он не так уж часто и нужен, если честно. 3.5 мм при достаточной широкоугольности вполне себе удобен – у меня был такой окуляр, использовал на Добе 12. Добрый день, Руслан! Имеется Nexstar 127 slt, обратил внимание, когда применяю окуляры SW 7мм 58′ (214х) и 20мм 66′ +лб 2х, присутствует как бы задний, слабый свет, на фоне которого наблюдаемые яркие объекты, Юпитер, Сатурн, Марс. Что это может быть? И ещё вопрос. Какой посоветуете взять окуляр Celestron Omni 32′, или 40′? Заранее спасибо за ответы! Здравствуйте. Странно. Попробуйте заглянуть в фокусер\диагональ без окуляра – источник бликования должен проявиться. Из окуляров лучше взять 32 мм – у 40 мм поле небольшое (около 40 гр), а вынос зрачка неудобный. Сам использую 32 мм с али за 1000р, доволен. Руслан,у меня есть Барлоу х2, с Алиэкспресс, о которой вы рассказывали здесь на сайте.Стоит ли брать НПЗ х2 или по качеству изображения они сопоставимы? Телескоп МАК. Большое спасибо! Наверное закажу номер 2. 3) SVBONY 1,25 ”окуляр SWA 58 градусов 3,2 мм/4 мм/6 мм(мне надо 6 мм). Здравствуйте! 1 и 2 – одно и то же. Я бы взял тот, что дешевле. Здравствуйте, подскажите какой окуляр и фильтр, стоит подкупить к телескопу Доб 8? Добрый день! Из фильтров я однозначно рекомендую взять кислородный OIII – желательно 2 дюйма. Он отлично работает по газовым туманностям. Из окуляров – для планет лучше взять что-то широкоугольное и короткофокусное (фокус 4 мм, поле зрени – от 60 градусов). Плесслы не берите – у них поле зрения крохотное. Можно использовать 10 мм окуляр с 2х Барлоу. Для туманностей – окуляры 32…35 мм, 20 мм, 14 мм. Можно еще зум-окуляр взять Celestron 8-24 мм – он достаточно удобен на добсоне и позволяет быстро подобрать оптимальное увеличение, но на 24 мм у него поле зрения маленькое, желательно продублировать это фокусное расстояние каким-нибудь широкоугольным окуляром типа ES 24 мм 68 гр или Celestron X-Cel LX 25 мм. Здравствуйте. 4 мм окуляр на этом телескопе лучше не использовать, предел – 6 мм окуляр для Луны и планет. Для наблюдения слабых объектов лучше использовать 32 мм окуляр. Также рекомендую заменить оборачивающую призму на диагональное 90 градусное зеркало – качество картинки должно улучшиться. Телескоп хороший, надо только реализовать его возможности. Подскажите еще вопрос. какой из этих окуляров лучше подойдет?TMB 2.5 мм или TMB 3.2 мм? как писал выше 2001 eq5 телескоп. на 2.5 мм он даст максимально полезное увеличение же? Пожалуйста 🙂 И Вам спасибо за поддержку! Добрый день! Я бы взял 3.2 мм – по планетам он будет оптимален. По Луне можно попробовать и 2.5 мм. Гнаться за предельным увеличением особо смысла нет. На 200 мм телескопе оптимально по планетам кратность около 300х. Здравствуйте! подскажите стоит ли покупать окуляр Sky-Watcher Zoom 7–21 мм? у меня телескоп 2001 eq5. вот думаю взять этот и линзу барлоу 3х. Здравствуйте. Лучше взять 8-24, он получше будет по оптике. А так – на BKP2001EQ5 по дипам самые ходовые окуляры 16-18 мм и 10-11 мм. По планетам – 3 мм. Набора из трех или четырех окуляров будет достаточно для всех видов наблюдений. Вы как то рекомендовали купить окуляр Svbony 1 шт. окуляр FMC 1.25 “68 градусов ультра Широкий Формат 6 мм и такой же на 32мм. Шестимилиметровый я заказал, а вот на 32 нет в продаже на али. Подскажите где можно купить в другом месте или каким заменить аналогом? Скоро и у нас будет ясное небо. Зима выдалась долгой, снежной и холодной. Что до сих пор оттаиваем. Всё что вы посоветовали, купил. Огромное вам спасибо за это. В одном совете я все же ослушался, купив Sky-Watcher Explorer-300 PDS OTA. Вот уже как два месяца он стоит без дела, жду пока бельмо не сойдет с неба. Здраствуйте подскажите плиз линза барлоу селестрон омни 2х пойдёт к рефлектору sw1149? Вроде как заявляют из бюджетного сигмента даже чернение боковых граней линз есть помимо просветленной оптики!? Спасибо. Здравствуйте. Да, вполне подойдет. Однако и обычная бюджетная 2х Барлоу с Т-адаптером тоже вполне неплохая. Здравствуйте, Star hunter) Подскажите, как-то давно я с вами общался что докупить к Bk707 az2, но не могу найти эту переписку уже) С али тогда я взял по вашей ссылке свбони линзу барлоу 2Х. Недавно заказал окуляры 25 и 10 мм широкоугольные свбони тоже а алишки со скидкой хорошей. Подскажите что еще докупить? 4-5,5 для планет или линзы барлоу с 10 мм хватит? Но все таки как я знаю чем больше зеркал так сказать тем больше потеря качества) Может что то посоветуете?) спасибо. Здравствуйте. 4 мм будут избыточный на этом телескопе. Оптимально по планетам – 6 мм (или 10 мм + 2х Барлоу) Я бы взял еще 32 мм окуляр 1.25, для наблюдения звёздных скоплений (ну и в качестве поискового). Пожалуйста. И Вам ясного неба! Здравствуйте! Omni XLT 127 или Celestron Nexstar 127 SLT? Руслан,приветствую,посоветуйте для МАК90 зеркало(призму)45градусов для наземных наблюдений. С 90гр. совсем неудобно. Сделана качественно, но просветления на ней нет. Для наземки вполне достаточно. Celestron X-Cel LX 7 мм для планет неплох. Если подешевле, то китайский 6 мм 66 градусов. Весьма полезен будет зум Celestron 8-24 мм. В качестве обзорного – 32 мм 1.25 мм плессл. Для туманностей – Deepsky OIII фильтр. Руслан, а есть ли смысл купить линзу Барлоу 2″ для комплектного SW LET 28 мм 2″ для получения 14-18 мм ? Доброе утро! Нет, смысла нет в 2″ Барлоу. Проще реализовать это отдельным окуляром. Простая линза Барлоу (без телецентричности) будет увеличивать и без того большой вынос зрачка. Плюс слишком большая и тяжелая конструкция получится. Окуляр по ссылке (15 мм 80 гр) отвратительно работает со светосильными трубами. Можно еще Celestron Luminos посмотреть, они немного хуже, чем ES, но всё же неплохи. Хотел спросить совета у Вас. Приобрёл трубу SW BKP 150/750. В комплекте с ней получил два окуляра: 28 мм 2″ и LET 2 мм 1,25″. 1)Возможно ли как-то модернизировать окуляр 2 мм, чтобы можно было его использовать на этой трубе? Или в утиль? 2) Для планет заказал 6 мм 66° + линза Барлоу 2х. Жду. Какой посоветуете ещё недорогой окуляр или два в комплект к имеющимся? 3) Есть ли смысл для этой трубы брать недорогой Plossl с фокусом 32 мм и 40 мм? Небом заинтересовался только-только и пока понятия не имею чего именно хочется и затянет ли. А попробовать хочется, только вот думаю не многого я пойму с окуляром 28 мм. А так, пока буду мастерить монтировку Добсона, и окулярчики приедут. 1) 2 мм у меня есть. На этой трубе получается кратность около 375х – многовато. Я думаю, его лучше продать, ибо модернизировать там нечего – отрицательный компонент и так находится глубоко в юбке окуляра. 2)В качестве универсальных по дипам рекомендую 16-18 мм и 10-11 мм. Из 16-18 – либо ES 16\68 1.25″, либо ES 18\82 2″, или аналогичные Meade. 3)Плессл при наличии 28 мм окуляра не особо имеет смысла. 40 мм при светосиле 1:5 бесполезен – слишком большой выходной зрачок. Es это Explore Scientific? Как-то дороговато для попробовать. На такие суммы пока не расчитывал. Или может есть аналоги дешевле. А Плесслы в этих диапазонах (10-11 и 16-18) совсем плохи на этой трубе? Или может есть что-то нормальное? Если можно, киньте пару ссылок. Может я не то ищу. Да, Explore Scientific. Дорого, но качественно) Плесслы будут работать вполне удовлетворительно, но точек по полю ждать не следует. Неплохи Баадер Гиперион 17, 13 и 8.
http://ali.pub/27v8j4 из этих хороши 6 и 9 мм. 15 мм за свою цену пойдет – на светосильном Ньютоне, пожалуй, даже хуже плессла будет. А что можете сказать по поводу Levenhuk RA UWA 16 mm? На светосильных телескопах не очень. ES 16\68 лучше. Но вынос зрачка меньше. Подскажите, пожалуйста, какому окуляру отдать предпочтение – Celestron Luminos 15mm или Baader Planetarium Hyperion 17mm? На сколько я понял, они покажут примерно одинаковую картинку. Celestron заказывать в B&H (примерно 6 т.р. выйдет), а Baader – б/у около 4,5-5 т.р. И правда ли, что в окуляре Baader Hyperion можно менять фокусное расстояние кольцами или фильтром без потери качества? Это подкупает в нем. Пока в моем арсенале 6мм, 9мм (66*), ЛБ 2х, и комплектный LET 28mm. Добрый вечер, Андрей! На каком телескопе будете использовать окуляр? У Luminos поле зрения 82 градуса, у Hyperion – 17 мм. 17 мм, если не ошибаюсь, не является масштабируемым по фокусу при помощи колец. Смотреть на SW BKP 150/750. Стеллариум при таких параметрах показывает примерно одну картинку – немного в разном масштабе. Про удлинительные кольца для Гипериона прочитал в описании на сайте производителя. Я бы не брал ни тот, ни другой. Как будет Hyperion по качеству коррекции – не могу сказать, но думаю, что не очень хорошо. У меня самого Nagler 17 тип 4 82гр. Могу посоветовать ES 18 мм 82 гр, либо ES 14 мм 82 гр, либо ES 16 мм 68 гр (но у него вынос зрачка небольшой, а по коррекции очень хорош). хочу купить если подойдет и пройдет Вашу экспертизу..
Немного накопилась сумма и готов сделать первые три покупки по Вашим рекомендациям выше. Но товар чуть другой чем был рекомендован, а посему хочу попросить Вас посмотреть их еще раз. Покупать или нет? 3. Барлоу 2х для фотокамеры. А использовать его с комплектным 10 мм окуляром получится? или получится только с ним? Привет! Sky-Watcher\Celestron – одно и то же, лучше брать 8-24. Барлоу тоже индентичные по ссылкам, берите ту, что дешевле. Для астрофото окуляр не используется. Для визуальных наблюдений – да, можно комбинировать с окулярами. По планетам, конечно, желательно Барлоу с большой кратностью, однако на первое время можно и этой обойтись, в зависимости от полученного результата с конкретным телескопом. Большое Вам спасибо за советы и потраченное время. Совершил некоторые покупки, надеюсь что всё купил верно. Не стал брать по месту проживания. Цены больно колючие. Рискнул с Китаем… Последний раз после покупок оттуда, сняли с карты деньги. Так технично, что банк не нашел какого-либо преступления “в отправке мною денег родственнику китайцу”. Посмотрим, объявится ли еще один мой родственник оттуда или таковой был лишь один на почти на три млрд..
Что забракуете из них, Руслан? Привет! Забракую номера 1 и 4. Руслан, спасибо за совет с правильным товаром и за забракованные..! Я сразу же купил тот, что Вы посоветовали..
И на этом дорогой штатив. Без штатива отличная цена на сам телескоп. Руслан, может есть подешевле и на него штатив (монтировка) без этого пульта и механизмов? Если неохота платить за монтировку – берите телескоп на монтировке Добсона, но тогда руками надо будет крутить (Sky-Watcher BK Dob 12 Retactable). Либо брать голую трубу, а монтировку Добсона самому делать (из дерева). да я в принципе тоже на большом я то думал может какую контрастность дает вне линии терминатора, четкость а так он и нафиг получается не нужен? Ну самое главное, что для наземного наблюдения картинка отличная и хорошо , а вот вы бы не подсказали , что дает лунный фильтр? Ни разу не юзал им а цена скажем для кокого то фильтра как по мне незнающему кажется немалой, какие он дает преимущества при наблюдении?спасибо. Лунный фильтр ослабляет яркость. При наблюдении Луны в полнолуние на небольших увеличениях яркость слишком высокая, глазу неприятно, хотя и безвредно. Надо брать нейтральный лунный фильтр, по цене он не более 1000р. Понаблюдайте Луну – если будет дискомфорт, то можно и фильтр прикупить. Я обычно на большом увеличении смотрю, проблем с яркостью нет. скай вотчер 1149бк поле зрения такое же как в обыкновен. супер20-25мм не знаю а качество картинки как в моем монокле 8х30 времен наверное 80х г. отличное и четкое как собственными глазами кустики расматриваю вблизи ну а как насчет фокусера в горизонтальном положении явот честно тоже думал ,что на боку лижать будет изображение ан нет все четко горизонтально. Мож мне удачный окуляр попался? Ну, по кустикам оптику особо не тестируют 🙂 Впрочем, при 30-40 градусах там плохому полю особо негде и быть, т.к. оно уже всё обрезано диафрагмой. здравствуйте вот решил поделиться с вами спрашивал вас уже по поводу правильно ориентированной картинки в рефлекторе вот купил селестрон erecting eyepiece 20mm все стало на свои места изображение четкое никаких искажений цветопередача реальная ничто не веньетит никаких ,,замочных скважин,, картинка прекрасная идеальная оптика вся просветленная и самое главное , что повернул я трубу так что фокусер стал почти параллельно полу сел на стульчик …ёмаё а картинка в окуляре четко горизонтальная верх это верх лево право на своих местах просто класс, но как так ,а все говорили , что с оборачивающим окуляром изображение отвратительное и надо фокусер располагать строго вертикально чтобы картинка на боку типа нележала , а на самом тоделе она все равно горизонтальная вот не ужели никто этого не знал? Спасибо. В 20 мм оборачивающий окуляр поле зрения около 30-40 градусов – это очень мало, но вполне достаточно для наземных наблюдений. Попробуйте сравнить с обычным (не оборачивающим окуляром) 20 мм. Призмы спереди без просветления, я осматривал такой окуляр. При дневных наблюдениях зрачок сужается, частично маскируя недостатки оптики. Нам очень жаль: платежи из страны, в которой выпущена ваша карта, сейчас не принимаются. Если у вас есть другая карта, попробуйте использовать ее. Или выберите новый способ оплаты. Хотел молча выразить благодарность, но Ваша система не принимает мою карту. Как быть? Может через интернет-магазин? Я сделаю покупку, но Вы не вышлите товар..
По Луне выжмет, по планетам вряд ли. Не советую к покупке. По планетам от него требовать много не следует, а вот по дипскаям он будет неплох. У меня самого схожая труба, но под маркой Celestron и фокус чуть больше (660 мм). Кратность считать так – 500 делим на фокус окуляра. По Луне\планетам предельная кратность около 150х (3.5 мм окуляр), по дипам минимальная кратность – около 15х (32 мм окуляр). Советую купить зум-окуляр Celestron 8-24 мм, он очень удобен и достаточно универсален, а также OIII фильтр 1.25 для выделения газовых туманностей и нормальное диагональное зеркало 90 градусов. Вроде бы урок по вычислению кратности я освоил, надеюсь на это. Если Вы проверите мои три примера в комментарии выше. Этот окуляр (Celestron 8-24 мм) и этот фильтр (OIII фильтр 1.25) и это – “диагональное зеркало 90 градусов”, а так же Барлоу из ссылки. первые в очереди на покупку. Всё, узнал, что такое – “нормальное диагональное зеркало 90 градусов.” На моем стоит эта деталь на 45 градусов. – Sky – Watcher 102 AZ. – Sky – Watcher SWA-58-4 WA Plossi 4mm Eyepiece. И этот окуляр не сильно обрадовал, а даже малость расстроил. Звезды такие же мелкие и мутные. По чеснаку на звезды я и не рассчитывал, слишком они далеки, а вот увидит свою любимую планету Сатурн был расчет и желание было очень сильным. Хотя бы мутно, пусть даже и маленький. Не увидел..
А сдаваться мы не обучены как и не ученные, а посему смекалка посоветовала соединить телескоп и фотик Canon EOS. Так сказать объединить две могучие силы, кратность и zoom. Купил, пришло. И тут “позднее зажигание” начало ржать, поняв, что мощный объектив придется снять с фотика. Но все же соединил с большой верой на великий “Авось”, на зло “позднему зажиганию”. И-ии, эффект, ну-уу чуть лучше чем с объективом для съемок на дальние расстояния. Теперь подумал и решил, “авось” и “позднее зажигание” не покажут мне любимую планету. Нужно спросить у Героев Галактик, покорителей безграничной Вселенной…..
– Эта модель вообще-то способна показать ближайшие планеты, если купить подходящий окуляр? – Что можно увидит с имеющимися окулярами и телескопом? Спасибо за ранее всем, кто возьмет на себя интеллектуальный труд развеять мой – Авось Позднее Зажигание..
Привет! Можно модель поточнее? Sky-Watcher BK MAK102AZGT SynScan GOTO? BK 1025AZ3? В любом случае звёзды в любой телескоп видны как точки из-за огромного расстояния до них. Единственная звезда, на которой можно что-то рассмотреть – это Солнце, однако надо обязательно использовать апертурный защитный фильтр. По фотоаппарату – да, при съемке не используется объектив камеры. Для съемки планет надо еще линзу Барлоу (для зеркальной камеры ее кратность должна быть такой, чтобы общее отн. отверстие было около 1:25 – то есть для Мака 102 достаточно 2х Барлоу, для рефрактора 102\500 надо 5х Барлоу). Кроме того, в камере должен быть кроп-режим видео (запись не со всей матрицы, а с ее центрального кусочка). Такая функция есть в 550D, 600D, 60D, в остальных камерах Canon она может реализовываться прошивкой ML. Большое Вам спасибо, Руслан, за развернутый ответ на мои глупые вопросы. Уверенно скажу, что понял процентов 15-20 из вашего доходчивого ответа. И то, из первой части – как смотреть на солнце (я вообще не думал, что можно смотреть на этот объект этим телескопом из-за угрожающей красной наклейки с перечеркнутым на нем солнцем), всё, теперь куплю качественный фильтр, чтобы не сжечь оставшиеся мизерные проценты увядающего зрения. Старость совсем не радость))..
Сатурн разглядеть пробую с начала этой недели и не факт, что я смотрел именно на эту планету, сомневаюсь в этом из-за сделанного мною открытия вчера ночью. Будучи уверенным, что все время любовался Сириусом, вышло что это была звезда Ригель. Засомневался, когда чуть выше крыши одноэтажного частного дома соседа появилась еще более яркая красавица. Покопался в интернете, нашел программу, многими рекомендуемая, называется “Stellarium”, благо быстро разобрался в ней и смог с ориентироваться по знакомым трем звездам. которые я замечал уже давно в ночном небе. У меня всего три ориентира в небе, пока что.)) Солнце, Луна и те три звезды их названий еще не знаю..
За список видимых объектов моим телескопом и окулярами, отдельное Вам огромное спасибо. Список вселил уверенность, что телескоп хоть на что то годное, если не заброшу самообразование. Хотя и эта модель не дешевая, все же буду стремится купить в следующий раз модель для взрослых.))) А пока потренируюсь на этом, на детском))..
Я снял трубу и вертел им долго, стараясь найти точное название модели, но все усилия оказались тщетными, как и у волка с колобком.))) Кроме одной заводкой пластины на нем нет ничего более уточняющее название модели. На квитанции лишь начало самого бренда. На брошюрках тех.поддержки представлен весь ряд “AZ”, но если играет роль еще одна буква, то это “S” полное название такое – “S-W ST 102 AZS” но мой с двумя ручными крутилками..
Про фотик не понял ничего, кроме того, что нужны еще приспособления))..
Руслан, какие окуляры Вы посоветуете купить для достижения х204 кратности? И какую кратность выдает этот окуляр – Sky — Watcher SWA-58-4 WA Plossi 4mm Eyepiece? И последнее, завидую белой завистью Вашим знаниям и коллекций телескопов и доп.принадлежностям. Удачи Вам с интернет-магазином..! Скорее всего, что это Sky-Watcher BK 1025 AZ3. Такой? Если да, то по планетам он будет не особо хорош, а вот по дипскай объектам сойдет. Чтобы рассчитать кратность, надо фокусное расстояние телескопа разделить на фокусное расстояние окуляра. В данном возможном случае получаем с 10 мм окуляром кратность 500 мм : 10 мм = 50х. Для наблюдения Солнца надо фильтр пленочный Baader Astrosolar Visual, спереди на объектив одевают его. Можно купить 2х Барлоу хорошую и использовать с комплектным 10 мм окуляром – получите 100х. Если качество картинки по Луне\планетам устроит – можно “разогнать” линзу Барлоу до 3х при помощи удлинительных втулок. Либо действительно сразу купить 4 мм окуляр, но он будет дороже, чем Барлоу. Для стыковки зеркалки и телескопа понадобится Т-кольцо Canon. (Canon EOS T2 ring). Я не увидел Ваш комментарий и поэтому написал свой второй, предположив, что ответ будет только завтра. Оказывается Вы определили его точно и ответили сразу. Всё, теперь буду расшифровывать и вникать в Вашу информацию. Спасибо за советы и объяснения..! Жаль, что я повелся на магазинный коллаж из планет якобы доступные этой трубе.. Следующий раз посоветуюсь с Вами. Одно уточнение: Если окуляр 4мм или 5мм или 25мм : 500, то правильно я думаю, в первом случае будет х125 а во втором примере х100, в третьем всего лишь х20, значит ли это, что чем меньше “мм” у окуляра, тем выше кратность у телескопа, или я упускаю еще какие то вводные? Простая арифметика? Да, верно – чем меньше фокусное расстояние окуляра, тем больше увеличение. Но с учетом фокусного расстояния конкретного телескопа. Чем больше увеличение, тем тусклее картинка – это нормально и на всех телескопах. Звезды на больших увеличениях всё равно видны как точки. Большие увеличения применяются по Луне и планетам, маленькие и средние увеличения – по туманностям. ну, пока вроде бы все, большое спасибо. Понятно плано забыли, а что лучше cel или meade по качеству? И еще как окуляр SW UWA 58* 4мм? СПАСИБО. SW 4мм не проверял – думаю, он будет похуже, чем X-Cel или Meade. Э,причём тут монтировка у меня eq2 я про окуляр Плано что то некоторые говорят о качестве его обратное /есть типо дефекты/. Deepsky Plano – неплохая линейка, но у них может отпадать краска с внутренних частей корпуса. Поэтому надо проверять окуляр перед покупкой. Можно взять его копию в другом корпусе – Celestron X-Cel LX 5 мм или Meade HD-60 4.5 мм – то же самое оптически. На 1149 будет хорошо работать по Луне и ярким планетам. Здравствуйте,опять я. Вот заинтересовали меня тут люди окуляром дипскай Плано 4.5мм и качеством и ценой, а что вы скажете как он на sw1149bk пойдёт? Спасибо. Привет! BK1149 надо брать на монтировке EQ2 (маркировка BK1149EQ2). Бывает еще на EQ1 дешевле, но он совсем уж хлипкий. Для балкона не очень вариант, для двора подойдет. Спасибо за совет. Еще хотел бы узнать как обернуть картинку на правильно ориентированную в ньютоне без не предназначен неудобно.конкректно может окуляр оборачивающий или призму 45* сказали вроде что если ее вставить в барлоу то будет норм изображение. Спасибо. Здравствуйте. Подскажите какую все же приобрести качественную линзу барлоу 2х и от какой цены прыгать для трубы скай вотчер 114/900 бк и посоветуйте окуляр для максимально полезного увеличения с широким полем зрения.спасибо. Для данного телескопа оптимальная максимальная кратность составляет около 170-200х, то есть нужен окуляр с фокусом от 5.2 до 4.5 мм. Хороший широкоугольный окуляр для такого телескопа – Baader Hyperion 5 мм. Если подешевле, то Celestron X-Cel 5 мм. А вот если я хочу заказать в интернет-магазине, как я могу проверить на наличие “неисправностей”? А окуляр 66 градусов 6 мм можно покупать прям по той ссылке алиэкспресса, которую Вы мне вчера дали или это было для примера (надежный ли там продавец)? Сообщить о необходимости обязательной предпродажной проверки продавцу магазина, чтобы он сам всё внимательно осмотрел. Из DS Plano (X-Cel, Meade HD) хороши 25 и 6.5 мм, остальные похуже. 6 мм 66 гр – да, прямо по ссылке. Продавец надежный, покупал у него. И да, понимаю, что на двух стульях не усидишь, в моем случае на трех, но хотелось бы ,чтобы окуляр оставлял как минимум не отрицательное впечатление как на имеющимся 114-м, так и на “будущем” . И последний вопрос, если можно. Если я приобрету 6 мм 66 градусов или Плановские 4,5 мм или 6,5 мм, нужен будет корректор комы, или для визуальных наблюдений не существенно? Да запросто могут продать что угодно) Так что лучше предупредить магазин, чтобы проверили всё как надо. Корректор комы не нужен для короткофокусных окуляров. Для визуальных наблюдений он тоже особо не нужен, во всяком случае я наблюдаю без него и не парюсь) а вот для астрофото туманностей и галактик корректор комы крайне желателен. 1- сейчас обладаю SW 1149, в планах приобрести либо SW 150/750 , либо SW dob 8″. цена примерна одинаковая. И вот вопрос – будет ли рационален переход от 114 мм к 150 мм (будет ли ощутима разница) , по сравнению, допустим, с переходом от 80 мм к 114 мм. По площадям объективов разница примерно равная, а что будет на деле? 2- и еще , если можно. Нуждаюсь в хорошем короткофокусном окуляре. Выбор по цена/качество пал на Deep Sky Plano 4,5 мм. Можно узнать ваше мнение о нем в целом и как он будет себя “вести” на нынешнем 114-м, и запланированных 150/750 или dob 8″? Здравствуйте. Между 114 и 150 мм разница примерно в 1.7 раз при том же увеличении. Если честно, со 114 мм я бы переходил уже на 200 мм, а именно на BKP2001EQ5, либо Доб 8. Для планет на 150750 надо 3 мм окуляр, либо Барлоу 2х + 10 мм окуляр, либо Барлоу 3х + 9 мм окуляр. Для Доба 8 надо 4 мм (300х). На 1149 4.5 мм всё же будет избыточен (200х), лучше 5 мм или 6 мм попробовать. Спасибо. Да, про площади я понимаю… Вот тоже думаю, что в 150 не будет разницы в стиле “вау” , хотя мне невиднее )) с одной стороны хочется и 200 мм добсона, а с другой как-то страшновато, кажется, что будет вся конструкция низко и , допустим, чтобы точно навестись в околозенитную область нужно будет чуть ли не ложиться… А 150-й, с таким же бюджетом, сам хорош, но алюминиевые слабые ноги. У его аналога от селестрона, ноги стальные, но говорят, что качество , грубо говоря , от трубы к трубе меняется… В общем , большая дилемма.— А вот что касается , все же , качества DS PLANO 4,5 мм в целом. Есть окуляр 6 мм из комплекта Celestron Astromaster, наверняка знаете, так вот там основная проблема для меня, это его “замочная скважина” . Да, Доб 8 по высоте мне не очень нравится – низковат. Алюминиевые ноги не так уж и плохи, можно не только наблюдать, но и лунно-планетной съемкой заниматься, а при безветрии – и дипскай можно поснимать. Спасибо, присмотрюсь к нему, тем более не такой дорогой как другие. Но все таки 6 мм взять можно, но для фокуса 750 будет маловато. а вот 4,5 уже получше. и все-таки, DS Plano 4.5 мм лучший по цене/качеству или же есть недороже него с фокусом около 4 мм надлежащего качества? Для 150\750 по планетам надо 3 мм окуляр по планетам. 4.5 мм -это 167х (1*D). На 150750 самые ходовые окуляры – 16-18 мм, 9-11 мм, 6-7 мм, 3-3.5 мм. Плано хорош, но надо проверять обязательно перед покупкой на наличие следов пыли и краски в поле зрения, а также отсутствие следов разборки окуляра. Я тестировал окуляр X-Cel LX 7 мм (он же Deepsky Plano 6.5 мм). Окуляр мне очень понравился и по картинке, и по выносу, и по степени коррекции. Вполне может работать с 2х Барлоу, тогда получится планетник. Большое спасибо. Бюджет не велик. Попробуем для начала плесслы 32мм. Для дипская имелось ввиду просто по звездному небу обозревать. В имеющиеся 20мм масштаб охвата маловат будет. Если бюджет небольшой – можно взять обычный плессл 32 мм 1.25″, либо Deesky SWA 32 мм 70 гр. При большем бюджете – Explore Scientific 24 мм 68 гр, 28 мм 68 гр или 30 мм 82 гр. Обзорный в смысле обзорно-поисковый по дипскаю с биноприставкой. Еще по Луне и Солнцу интересуют окуляры более контрастные, т.к. биноприставка срезает контраст. Какие можете посоветовать, чтобы компенсировать это в какой-то мере? Нам кажется слишком много стекол получается с окулярами WA 8mm + биноприставка + л/б 2х + диагональ + ED труба. А хотелось-бы на Солнце кроме пятен и гранулы понаблюдать. 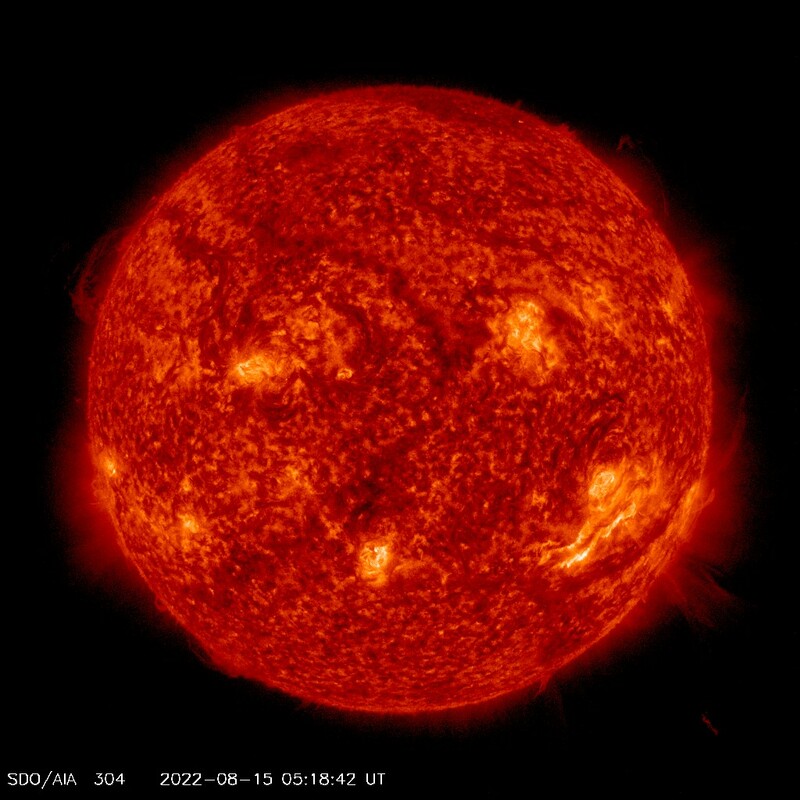 Рекомендуют конечно для Солнца купить фильтр Baader Solar Continuum , но настораживает , что с солнечной диагональю от Интес + фильтр ND3 + фильтр Baader Solar Continuum + биноприставка совсем темное изображение получится. И не видать нам гранул на Солнце , как своих ушей. Возможно помогут какие-нибудь плесслы или ортоскопики ? Там линз поменьше, может и контраст повыше? Какие на Ваш взгляд посоветуете? Для дипскаев биноприставку на апертурах менее 250 мм лучше не использовать – сильно садит яркость. По окулярам – с ортоскопами я бы не заморачивался, хватит ваших WA-окуляров. Просветление у современных окуляров весьма хорошее, так что особого смысла в ортоскопах не вижу. Здравствуйте Руслан. Просим у Вас совета. Телескоп ED110mm F/7 (недавно прибрели). Едет к нему биновьюер от Deepsky с корр. Л/Б 2х. К бино уже приобрели пары окуляров WA 8mm 1.25″ 65град , WA 12mm 1.25″ 65град , GSO superview 20mm 1.25″ 68град. Так-же в наличии есть пара МБС 14х , линза барлоу 2х НПЗ , набор фильтров. Сегодня еще прислали Солнечную диагональ от Интес Микро , но фильтр ND3 еще в пути. Посоветуйте , с учетом всего перечисленного , какие окуляры еще нужны в визуале Солнца , Луны , планет и обзорные для биновьюера ? Здравствуйте! Хороший наборчик. По планетам на 110 мм рефракторе рабочие увеличения около 180-220х. Получается фокус окуляров для 200х в районе 7.7 мм (с учетом 2х Барлоу). Восьмёрки как раз подойдут, т.к. в биноприставку картинка более тусклая, чем если смотреть одним глазом без бинки. По Солнцу увеличение надо подбирать, тут конкретно не подскажу. В принципе, указанного набора достаточно для лунно-планетных наблюдений. Обзорный окуляр – для обзора слабых объектов или Луны? Артем , подскажите – у меня Конус Мотор Мах 90. Фокусер 1.25″. Хочу купить окуляр 2″. Есть ли смысл брать переходник 1.25″ на 2″? Привет! На этот телескоп нет смысла брать 2″ окуляр, т.к. выход у него 1.25″. Также диафрагма на выходе весьма небольшая, она кое-как реализовывает поле 1.25 окуляра. Я пробовал его стыковать с 2″ окулярами – поле заметно обрезается. От себя посоветую 32 мм окуляр 1.25″ и зум Celestron 8-24 мм. Привет, Руслан! Собираюсь приобрести окуляры X-CEL LX с фокусным расстоянием 25, 18 и 12 мм. Подкупает заявленная парфокальность и их стоимость на али. Что скажешь? На астрофоруме очень много негативных комментариев про то что не стоит покупать оптику на али. В своем обзоре окуляра ты рекомендуешь на али магазин: “Telescope Hunting Outdoor jade identification…” стоимость окуляров X-CEL LX сейчас там составляет 6 374,53 руб. Однако эти же окуляры можно купить у продавца “TianyuanStar Optical instrument Store” за 4 747,51 руб. Где лучше стоит купить? … в обзоре окуляра “Celestron X-Cel LX 7 мм”…. Привет! С окулярами на али, действительно, лоторея. Однако с окулярами Celestron X-Cel ситуация должна быть лучше – их всё же сложнее подделать, чем дешевые окуляры. Спишитесь с продавцом, пусть пришлет пару фото конкретных окуляров со всех сторон. По отзывам вроде всё хорошо, не подделки. вами окуляры и линзу барлоу. Очень хороший окуляр 66 6мм. И за это большое спасибо. И ещё странная ситуация,юстирую вторичное зеркало чиширом, потом проверяю лазерным коллиматором и все не правильно, все сбить. Юстирую лазерным, вставляю чешир так же все сбито. Лазерный коллиматор вроде откалиброваный…!? Привет! Диагональное зеркало лазером не юстируют – он может что угодно показать. Диагоналку чеширом надо. Главное зеркало можно лазером. Здравствуйте! Проверьте юстировку зеркал при помощи самодельного чешира. Также телескоп должен быть остывший перед наблюдениями (примерное время термостабилизации – около получаса. Возможно, что планета была слишком низко над горизонтом и атмосфера была неспокойная. Попробуйте посмотреть Юпитер или Луну в другой вечер, сравните резкость изображения. Кроме того, 10 мм окуляр комплектный показывает четко лишь в центральной области окуляра (около 30% поля зрения), дальше идут сильные искажения из-за плохой коррекции собственных искажений окуляра. Руслан добрый день. Синта 130650. Пришли линза барлоу х2 и окуляры. Устанавливаю линзу, в неё окуляр супер 10. Смотрю на Сатурн и вижу замыленное изображение. Чёткости мало. Скажите пожалуйста, в чем может быть причина. Здравствуйте! Синта BKP130650EQ2 или NBK130650EQ2? Добрый день! Достался в подарок Ливенгук детский, но нет окуляров на него. Подскажите, стоит ли заморачиваться и покупать окуляры и возможно ли будет хоть что-то увидеть в него. Еще маркировка в инструкции на окуляры, идущие в комплекте F20, F6, а на ebay я нашла H6, H20. Это одно и то же? Извините заранее за некомпетентность. Здравствуйте. Это окуляры системы Гюйгенса с фокусным расстоянием 20 и 6 мм. Сообщите, пожалуйста, маркировку телескопа. Окуляры тут, скорее всего, формата 0.965 дюйма (как в микроскопах). Для простых наблюдений он вполне подойдет (кратеры на Луне, полосы и спутники Юпитера, наличие кольца у Сатурна, однако что-то серьезное от него требовать не следует. Большое Вам спасибо за ответ! Модель телескопа Levenhuk strike 50 ng. Окуляры нашла вот такие SR4mm, H6mm, H12.5mm, H20mm 0.965″. Также нет линзы барлоу, подскажите пожалуйста, нужно ли ее приобретать или нет. С наступающим Вас праздником! Понял. Барлоу не нужна. Я так понял, Вы нашли набор окуляров на Алиэкспресс 🙂 Берите весь набор, особо альтернатив нет, его будет достаточно для простых наблюдений Луны и планет. 4 мм – бесполезный будет окуляр, т.к. кратность избыточная получится. Подскажи пожалуйста как и чем чистить линзы окуляров и барлоу чтобы не поцарапать. Здравствуйте. Можно мягкой тряпочкой-микрофиброй (для очков). Сильные загрязнения можно Lenspenом вычистить. Здравствуйте,с праздником вас). Подскажите пожалуйста,для synta 909eq2 какой окуляр лучше подобрать,для хорошего увеличения и качества картинки. Еще беру линзу барлоу2х с тадаптером…должна подойти. Добрый день. И вас тоже с праздником! Под 909 я бы взял еще два окуляра – 32 мм в качестве обзорного и 6 мм 66 градусов в качестве планетного. Гнаться за большим увеличением не следует, так как начинает падать резкость и контраст. Либо взять 32 мм окуляр, 2х Барлоу и использовать 10 мм окуляр в связке с Барлоу – получите 180х. Подскажите пожалуйста, в место покупки 3,2 мм окуляра будет ли целесобразнее (или экономически выгоднее) покупка линзы барлоу и 6мм окуляра? Если я правильно понимаю получается тоже самое. Или качество пострадает? Планируется использование на BKP1306EQ2. Качество не пострадает, однако окуляр лучше брать с большим выносом зрачка (6 мм 66 градусов). Обычный плессл 6 мм менее удобен. Здравствуйте, скажите, сталкивались вы с окулярами Sky-Watcher SWA Plossl и SWA-58? Имеет ли вообще смысл рассматривать широкоугольный? Какой из имеющихся в наличии (4; 6; 7; 9 и 2,5; 5; 8; 9 для WA) лучше всего взять для BKP13065EQ2 в дополнении к комплектным (10 и 25 + линза барроу) для максимальной универсальности? По универсальности – для 130650 самым универсальным будет окуляр с фокусным расстоянием около 14-16 мм (для наблюдения объектов каталога Мессье – галактики, туманности, скопления). Можно купить недорогой Плёссл с фокусным расстоянием около 15 мм. Недорогие широкоугольники (типа 15 мм 66 градусов) будут плохо работать со светосильными телескопами как 130650. Для наблюдения планет надо использовать окуляр с фокусным расстоянием около 3 мм, либо 7 мм в связке с 2х Барлоу. Здравствуйте, подскажите какие окуляры лучше подходят к телескопу Sky-Watcher BK P1501EQ3-2. Здравствуйте! Если подешевле, то можно обойтись 32 мм плесслом и 2х Барлоу – с комплектными окулярами получите весь набор увеличений. Если подороже, то советую обратить внимание на линейку окуляров Celestron X-Cel XL, а именно 25 мм, 7 мм и 5 мм. Если еще дороже, то Explore Scientific 82 или 68 градусов – ES 24\68, ES 16\68, ES 11\82, ES 4.7\82. Доброе время суток Руслан.Как то я уже задавал вам этот вопрос.У меня МАК127 2″+комплектные окуляры 10мм(очень маленький зрачек) 25мм(не плохой).Думаю купить к нему 2″ ЛБ GSO(у нее хорошая цена и по отзывам не плоха) + Целестрон Люминис 82° 31мм и 7мм по хорошей цене (из США).С ЛБ у меня будет большинство увеличений(кроме 10мм комплектного,я на него не рассчитываю).Я помню ваш совет ЛБ 1.25,но есть соблазн 2″ЛБ+31мм.Как вы смотрите на этот расчет? Возможно какие-то еще окуляры надо 15мм,19мм…? Не уверен, что 31 мм 82 градуса на Маке 127 мм заработает в полную силу – 2″ там больше формально. Скорее всего, будет сильное виньетирование. Думаю, 28 мм 68 градусов (ES или Meade) вполне будет достаточно, либо даже обычного 32 мм плессла. 2″ Барлоу + 31 мм 82″ – дрын еще тот получится, плюс выходной зрачок из-за ЛБ уедет. Не советую. В общем линейка нужна примерно такая – 32, 24(25), 14(15), 10(9), 7. Это вполне достаточно. Я также советую взять еще зум-окуляр Celestron 8-24 – на маке он достаточно удобен. Я думал о перспективах.Если любительская астрономия пойдет и я возьмуN200 или доб10)) ,а МАК оставлю для балкона.”Хорошие” 82° окуляры мне будут нужны + регулируемый наглазник.Ели покупать то шырокоугольные,а целестрон 82° там дешевле ES68°.Но всю линейку окуляров предложенных вами я не потяну,, сейчас,думал поиграть с ЛБ.Думал взять явный “планетник” Люминис7мм(80$) и 31мм(200$),для обзора, + ЛБ (75$). Могу выделить сумму ещё на 1 окуляр,но окуляры с фокусом от 10мм-19мм мне,пока, не понятно( для чего.Просить привезти,этих людей, другой раз,не хочется. Здравствуй, Руслан! Недавно узнал о существовании асферических окуляров. Хотелось бы знать твоё компетентное мнение о них – преимущества перед привычными сферическими, недостатки и пр., а то в инете об этом весьма скудная информация. Здравствуйте! Насколько знаю, асферические линзы позволяют лучше исправлять полевые аберрации окуляров. Линейку асферических окуляров выпускает Baader, однако из широкоугольных длиннофокусников лучшим выбором будут Televue Nagler 31 тип 5 или Explore Scientific 30 мм 82 градуса, которые без асферики, но, судя по отзывам, показывают получше, чем аналогичный Baader. Если нужен фокус подлиннее – советую обратить внимание на Televue Panoptic, либо линейку Explore Scientic 68 градусов (40 и 34 мм). А как насчёт “родных” китайских? Вот, напр., на Алиэкспресс предлагают по приемлемой цене ряд окуляров с асферическими линзами: SVBONY-Aspheric-Eyepiece-Telescope-HD-Wide-Angle-62-Degree-Lens-4-10-23mm-Fully-Coated. Понимаю, что не имея их, трудно что-либо сказать, но всё-таки? Добрый день! Будет ли полезен окуляр скай-вотчер супер 3,6мм 1,25″ для добсона 8″? Лунный фильтр нейтральный 96 будет нормальный для исследования луны? Цветные фильтры целессообразно докупить для исследования других планет? Спасибо! Здравствуйте. Да, по планетам вполне. Однако именно этот окуляр брать не советую, т.к. у него крошечный вынос зрачка, маленькое поле зрения и маленькая глазная линза. Нейтральный фильтр – 96, думаю, темноват будет. Попробуйте с пропусканием 13 или 25%. Цветные фильтры не берите. Разве что фильтр номер 47, он может быть полезен при наблюдении Венеры. Лучше возьмите фильтр Deepsky OIII 1.25, он по газовым туманностям хорошо работает. Уточняю – производитель, оказывается, есть – Solomark. Что меня смущает – на фотках окуляра, где практически не видно линз, есть маркировка на корпусе – 40 мм, а там, где видно просветление, стоит маркировка 32 мм! Хотя, конечно, есть надпись “multicoated”. Хитрят китаёзи или у них “пересортица”? Да китайцы просто фоток напихали всех подряд 🙂 Это нормальная практика. Можно всегда запросить фото у продавца. Значит, всё-таки лучше Плёссл 35 мм 52 гр.? Да, я за 32 мм Плёссл. Привет, Руслан! У меня Sky-Watcher 1149 EQ2. Присмотрел на Aliexpress окуляр noname Плёссл 40 мм с полем зрения 52 гр., а то с комплектным комплектным 25 мм окуляром всё-таки небольшое поле зрения, бывает трудно навестись на объект. Что посоветуешь – брать или не брать? Привет! Странно. С 25 мм особых проблем с поиском нет. 40 мм не советую, поле будет как у 32 мм, просто увеличение меньше. Бери 32 мм Плессл обычный. Просто хочется подобрать обзорный окуляр, дающий увеличение, наиболее близкое к равнозрачковому, в данном случае равнозрачковое Д/6=114/6=19. С окуляром 40 мм увеличение будет 900/40=22,5, что ближе, чем 900/32=28,13. Или я не прав? Так что не советую гнаться за равнозрачком. Например, берём 2 Плёссла с одинаковым полем зрения 52 гр., но с разным фокусом 32 и 40 мм (оба варианта есть в продаже на Aliexpress). Увеличение на 32 мм у моего скопа будет 900/32=28, истинное поле зрения – 52/28=1,86 гр., при использовании 40 мм – увеличение 900/40=22,5, истинное поле зрения – 52/22=2,36 гр., т..е. у окуляра 40 мм поле зрения на 0,5 гр. больше, а ведь это угловой размер Луны или Солнца! Проблема в том, что у 40 мм окуляра поле меньше, чем 52 градуса и составляет около 40 градусов. Поле зрения ограничивается размером полевой диафрагмы окуляра и в случае 32 мм окуляра этой диафрагмой является фактически юбка окуляра. Поэтому 32 мм окуляру системы Плессла с посадкой 1.25″ и полем 52 градуса будет соответствовать 40 мм окуляр с посадкой 1.25″ и полем (32\40)*52=42 градуса. Еще пример. У меня есть окуляр ES 24 мм 68 градусов и он дает то же самое видимое поле, что и 32 мм окуляр 52 градуса, хоть и с бОльшим увеличением. То есть диафрагма у 32 мм 52 гр 1.25″ окуляра такого же размера, что и у 24 мм 68 гр 1.25″. Нет, Руслан, это 2″ William Optics 15mm swan. Спасибо за подсказки. Люминос посмотрю обязательно. С уважением. Шевченко Андрей. Понял,спасибо, Руслан. Я решил продать этот ED 5,2мм и купить на Авито(видел есть) широкоугольный Вильямс Оптикс 15 мм 72гр. на 2″. Пора, думаю, к своему Скай Вотчер BK 102 подбирать окуляры на 2″. Что скажите, Руслан, правильное решение? На 1,25″ у меня есть 4,5мм, 6 мм, 10мм, 12,5 мм, 15мм, 20мм и 25мм. Думаю, что этих хватит. Просто хочется иметь на 2″ с более широким полем зрения. С уважением. Шевченко Андрей. Думаю, 1.25″ с головой хватит. 2″ есть смысл брать, если хочется 82 градуса типа 18\82, 30\82, 40\68 и так далее, но такие окуляры весьма дороги. Думаю, обзорного ES 24\68 вполне хватит для наблюдений. Достаточно дешево и сердито – Deepsky SWA 32 мм 72 градуса или Deepsky 35ED. WO 15 мм 72 гр 2″? А не 1.25″ ли он часом? Видимо, такая коррекция в окуляре. DS Plano 4.5 сам по себе хорош, а 6.5 мм вообще один из лучших в линейке. Здравствуйте,Руслан! Это Шевченко Андрей. Раньше писал Вам как-то. Подскажите,пожалуйста,ваше мнение по поводу окуляра DeepSky ED 5,2 mm. Я проверял его на Скай Вотчере Вк 102 рефракторе. С ДипСкай Плано 4,5мм все просто супер. А вот ЕД не понравился, дает сильный цветовой ореол. И по Луне, и по планетам, да и звезды дает с ореолом. Что скажите? С уважением. Привет! У меня был 3.8ED – нареканий особо нет. Какого цвета ореол? В центре или только на краю? Спасибо за ответ, тогда остаётся только этот вариант: http://ru.aliexpress.com/item/Datyson-0-965-or-1-25-inch-Microscope-Telescopes-Metal-Universal-Photography-Bracket-mount-For-mobile/32618006194.html?spm=2114.10010208.100009.14.XwK60o&scm=1007.13339.35814.0&pvid=3e08a92f-f943-4d1c-94be-5a1a4e66cf0a&tpp=0 . Появился ещё один вопрос. Что вы можете сказать об этом: http://ru.aliexpress.com/item/Angeleyes-7-5mm-22-5mm-zoom-telescope-eyepiece-HD-planets/32612730941.html?spm=2114.03010208.3.325.MjPora&ws_ab_test=searchweb201556_0,searchweb201602_1_10039_10048_10057_10047_10056_10055_10049_10059_10046_10058_10045_10017_106_105_104_10060_103_10061_102_10062,searchweb201603_3&btsid=6f00d862-0822-43ee-bcb3-f84b4e17fd16 ? Отзывы о “zoom”- окулярах абсолютно противоположные. Что можете посоветовать? Привет! Я могу посоветовать взять зум подороже – Celestron 8-24 мм. У него больше поле зрения, ну и сам конструктив получше. Сам пользуюсь таким. Покупал именно у этого продавца, доставка быстрая, окуляр в полном порядке, без дефектов. Вряд ли. А если и есть, то смысл использования такой камеры? Для серьезной съемки нет нормальных программ для видеозахвата на Android. и стоит ли заменить комплектный “super 10 mm” (Synta BK767AZ1) на один из них? 1) неплохой окуляр с большим выносом зрачка, но умеренным полем зрения. 2)бюджетный широкоугольный окуляр с малым выносом зрачка. Не советую. Спасибо! И если нетрудно то ещё вопрос про ЛБ, на примере той же Synta BK767AZ1. Телескоп + 10 мм + ЛБ = 140х. Телескоп + 5 мм = 140х. В чём преимущество ЛБ, для каких наблюдений её лучше использовать и с какими окулярами? Или это способ обойти 2D? А то некоторые производители при апертуре 60 разгоняют увеличение до 675х. ЛБ позволяет удвоить количество окуляров в 2 раза. Плюс она может немного улучшить качество изображения, если окуляры бюджетные, а телескоп светосильный. Хорошая линза Барлоу искажений не вносит. Также линза Барлоу немного увеличивает вынос зрачка. Для короткофокусных окуляров это плюс, для длиннофокусных – минус. если изготовление переходной втулки связано с токарными работами, с этим проблема. Есть ли смысл его брать, или всё же 6 мм будет лучше? Он примерно того же уровня будет. Можно смело брать. Только в заказе укажите, чтобы 5 мм выслали. Большоё спасибо! 25 июля ожидаю доставки Synta BK767AZ1, после проверки буду заказывать остальное. Скажите пожалуйста, для Synta BK767AZ1 – 6 мм это предел, по расчётам, вроде бы, его максимум 5-4,5 мм? Вначале я хотел заказать Synta BK P1145EQ1, почитав ваш обзор: http://www.star-hunter.ru/sky-watcher-bkp1145/ , но больше отзывов об этом телескопе не нашёл. Был один обзор который насторожил:https://www.youtube.com/watch?v=iTudiyLmNlw .Но после прочтения: http://astrobel.ru/obzor-teleskopov/-sky-watcher/teleskop-sky-watcher-1145eq1.html , решил отказаться от заказа,хотя телескоп очень понравился. Неужели за всё время выпуска этого телескопа не смогли наладить выпуск зеркал для него? В принципе, 5 мм обеспечит как раз 2D увеличение (140х), однако 5 мм можно получить, немного увеличив в окуляре 6 мм 66 градусов расстояние между отрицательным линзоблоком и блоком глазных линз. Здравствуйте! Пожалуйста, подскажите какой широкоугольный окуляр подойдёт для Synta BK767AZ1. Здравствуйте,а какая разница между этими окулярами? 6 мм 66 гр и 6 мм 68 гр – это один и тот же окуляр с разной маркировкой и в разных корпусах. 6 мм 58 гр – уже другой окуляр с другой конструкцией. Увы, я в него не смотрел, поэтому не могу сказать, как у него с коррекцией дела обстоят. Здравствуйте! Приобрел по журналу телескоп 1000/114 но он оказался из черного списка.так как остроном из меня никакой с юстировкой мучился почти полгода и то не уверен что точно все сделал. Несколько раз смотрел луну,ощущение что в супе чегото нехватает.к нему шли окуляры в комплекте:к6мм,к9мм,pl12.5mmк20mm,pl25mm,обратный1,5x/Erecting Eyepiece ибарлоу2х. Подскажите нужно ли к нему что то то из окуляров добавить или этого достаточно. И как довес ти до ума юстироку ? Там описывается юстировка аналогичного корректорного телескопа. Спасибо! Значит будем работать над образованием и телскопом еще раз спасибо! Здравствуйте! Ни в обзорах, ни в комментариях не встретил рекомендаций окуляра Celestron Luminos 1,25 15 мм. Что вы можете о нём сказать? Хочу купить его для МАК 102. Однако есть подозрения, что ES 14\82 будет лучше работать на светосильных Ньютонах, однако для Мака не принципиально – он нетребователен к окулярам. Если планируете в будущем покупать\менять еще один телескоп, а именно большой Ньютон, то есть смысл сразу брать ES 14\82. Если нет, то и Luminos 15 мм подойдет. Здравствуйте! Собираюсь покупать телескоп. Уже опредедилась с моделью (Sky Watcher BK1149EQ2). Но мне посоветовали докупить к нему окуляр. Планировала взять Celestron Zoom 8-24 mm 1.25″, но цены на него дико возросли. Стоит ли брать его аналог от Levenhuk? Может, существует какой-то аналог качественный, но дешевый? Или стоит дальше копить на окуляр подороже? Либо купить к 1149 еще пару окуляров – 6 мм и 32 мм – их и комплектных будет вполне достаточно для всех видов наблюдений. Был у меня такой окуляр. Вынос зрачка очень маленький (около 7 мм), наблюдать лучше без наглазника, и то приходится глазом втыкаться. Поле большое, достаточно близкое к 80 градусам. Для светосильных телескопов (f\5) не подходит, ибо по краям картинка уж очень плохая, а на f\5 телескопах 10-11 мм окуляр – основной по мелким галактикам и скоплениям. ES 11\82 намного лучше по качеству изображения, вынос зрачка заметно больше, однако стоит заметно дороже. Добрый день! Купил телескоп Sky-Watcher BK Mak102SP с окулярами 10мм и 25мм. Хочу купить окуляр 40мм. Какой посоветуете? Или, может, что-то другое порекомендуете? Привет! 40 мм не советую вообще – поле зрения небольшое (около 40 градусов), а вынос зрачка большой слишком, лично мне 40 мм окуляр системы Плессла не очень понравился. Берите обычный 32 мм окуляр, у него поле зрения побольше будет (около 50 градусов) и вынос удобнее. Спасибо, понял. А что лучше взять для максимального увеличения? 6 мм 66 градусов будет неплох. На алиэкспрессе он есть. для Celestron NexStar 127 SLT неспеша подбираю оптику – был бы блгодарен за рекомендации и оценки. Оба окуляра будут хорошо работать на твоём 127 SLT – он весьма нетребователен к окулярам. Доброго утра! Не совсем понял, для чего нужен корректор комы. Для всех светосильных телескопов, или при применении широкоугольных окуляров со светосильными телескопами? И ещё, для чего нужны сверхширокоугольные окуляры, если они не могут расширить предельное поле зрения телескопа? А ещё маленькое предложение: не плохо было бы сделать сервис-помощник по выбору окуляра, где на конкретные и похожие телескопы будут указаны все необходимые виды окуляров и линз барлоу. Можно сразу со ссылками мест продажи. Может, я слишком много хочу, но читая комментарии после ваших статей, увидел, что вам приходится просматривать и оценивать много ссылок. Это огромная работа. Хотя, может я и не прав? Может, легче ответить так, как это делаете вы? В любом случае, большое спасибо за ваш труд! Корректор комы обычно необходим для светосильных телескопов системы Ньютона (F\4…f\5) при использовании широкоугольных окуляров (от 82 градусов), однако в качественные окуляры кома не слишком бросается в глаза, во всяком случае с f\5. По широкоугольным окулярам. Во-первых, широкий угол позволяет лучше “погрузиться” в наблюдения – края диафрагмы 82 градусного поля практически незаметны. Во-вторых, некоторые протяженные объекты при большом увеличении видны лучше, но с обычными окулярами не помещаются в поле зрения. Например, при наблюдении туманности “Рыбачья сеть” в 300 мм Добсон с 2″ 30 мм 82 градусным окуляром (увеличение 50х, поле 1.56 градуса) помещается полностью. С аналогичным 32 мм 1.25″ окуляром реальное поле зрения составит 1.13 градусов, то есть в полтора раза меньше и туманность поместится в окуляр частично. В-третьих, с бОльшим полем проще искать объект. Часто длиннофокусные широкоугольные окуляры используют в качестве “поисковых”. Для телескопов на монтировке Добсона широкоугольные окуляры особенно актуальны при наблюдении планет, т.к. без моторов планета быстро убегает из поля зрения, а в широкоугольный окуляр она видна дольше. Понял. Тогда подскажите, пожалуйста, качественный длиннофокусный широкоугольный окуляр для Synta BK P130650EQ2. Длиннофокусность и широкоугольность у телескопов с 1.25″ фокусером ограничивается параметром 24 мм 68 градусов. Он хорошо работает на светосильных Ньютонах – он близок по схеме к более дорогому Televue Panoptic 24 мм. На светосильном Ньютоне он работает достаточно неплохо (хотя заметно хуже, чем Nagler 17 тип 4), однако заметно дешевле Наглера. Увы, окуляр весьма редкий и выловить его можно только на вторичном рынке. Deepsky SWA – не советую, качество картинки будет скверное. Также не рекомендую Baader Hyperion 24 мм 68 градусов 1.25″. Честно говоря, никак не могу привыкнуть, что длиннофокусный может быть широкоугольным. Крепко засели параметры объективов после долгого увлечения фотографией. Имеет смысл искать равнозрачковый окуляр, чтоб увидеть галактики/туманности? Или для такой игрушки игра не стоит? Если небо темное – попробовать можно. За равнозрачком гнаться не надо, достаточно 32 мм окуляра (21х). Я бы еще докупил окуляры 15, 9 и 6 мм (6 мм – для Луны\планет). Если к ориону претензий нет, то с СИНЯКом промахнулись – там именно фокусное разное… поправьте фотку или подпись. Спасибо большое, исправил. Как-то прощёлкал “Синяк”. Привет! Не советую брать ни одну, ни другую. Берите классику – 2x с Т-адаптером. Она легко гонится разгонной втулкой до необходимых 3х. Привет! Извиняюсь, был в отъезде. Ответил на Ваш предыдущий комментарий. Это будет 150х – вполне разумное увеличение при наблюдении планет. Длбрый день, вопрос про окуляр meade ma 9 mm (шел в комплекте с телескопом) как его расшифровать. Это Плёссл или Кельнер. Заранее спасибо за ответ. Прошу не судить строго, только начинаю разбираться во всем этом. Привет! Это Кельнер. У плесслов с таким фокусом линзы поменьше будут. да с зумом я ошибся ,конечно, 8-24. Т.е. такой пока не нужен. Были в комплекте : 4мм,9мм,10мм,25мм, по Вашему совету взял барлоу*2(ест*3 для разгона), жду, опять же слушая Вас, 32мм и зум 8-34мм. Небо второй месяц без звезд, хоть вой на Луну, так и ее нет! Думаю, пока хватит окуляров) 2х Барлоу можно с 9 мм окуляром использовать на Ньютоне. На Маке – зум 8-24 мм хорош. т.е.брать один для обоих телескопов? т.е.,если брать ,то какой оптимальный? Ну, зависит от цели – планетный окуляр, либо для звездных скоплений, либо для протяженных объектов. Какие окуляры у Вас уже есть? извините,что надоедаю, но вот в том же магазине есть набор окуляров 1,25″ 2,5мм/3,2мм/4мм/5мм/6мм/7мм7,5мм/8мм/9мм 58град.тмв планетарная окуляра(дословно). В чем смысл таких близких размеров или продают один на выбор? Разумеется, это на выбор. Размеры не совсем близкие, но и как бы всю линейку покупать тоже не надо))) Для МАКа вполне хватит окуляра до 7 мм, для Ньютона 114\900 – до 5 мм. т.е. не Кельнер, либо Плессл? А, что это за СУПЕР? Спасибо. Есть СУПЕР 25, так, что откажусь от лишних трат. Если у меня оба телескопа не светосильных так может стоит взять для знакомства? магазин CELESTRON Tier-one Agent №1245601 864,40р. Попробуйте. Если уже есть другой 25 мм окуляр (Кельнер или Плессл) – смысла в новом бюджетном окуляре нет. Вы говорите, что на светосильных телескопах такой объектив будет плохо работать. А как узнать светосильный у меня телескоп? (Bresser Galaxia 900*114 и Synta Sky-Watcher BK MAK 102). И все-таки что это за Мульти-карман покрытие? Нет, не светосильный. У светосильных отношение диаметра к фокусу 1:4…1:6. Мульти-карман – это Multi coated, неправильно переведенное название, многослойное просветление. Хотя, по фото я не сказал бы, что там многослойка. И эти тоже, да и какая разница с обычным, что он дает? Это бредовый переводчик на алиэкспрессе, наверное. 1.25 – посадка юбки, 23 мм – фокус, 62 градуса – поле зрения. Асферика – типа асферические формы линз, в чем я сомневаюсь. Основные параметры окуляров указаны в статье на этой странице. что означают все эти слова и что это дает? А, что Вы скажете о: Стандарт 1,25″ 23мм 62 градусов асферический окуляр широкоугольным объективом мульти-карман покрытием? Бюджетный окуляр, либо Кельнер, либо Плессл. Не думаю,что на светосильных телескопах он будет хорошо работать. Более-менее нормальный ширик стоит б\у от 4000р (Deepsky Plano 25 мм 60 градусов, например). Градусы делим на кратность (безразмерная величина) – получаем градусы. 1.25” 31.7mm 66-deg Wide Angle Eyepiece Lens Ultrawide 6mm Multi-coated for Astronomical Telescope Datyson или лучше есть цена/качество. Со светосильными телескопами этот окуляр работает без нареканий.